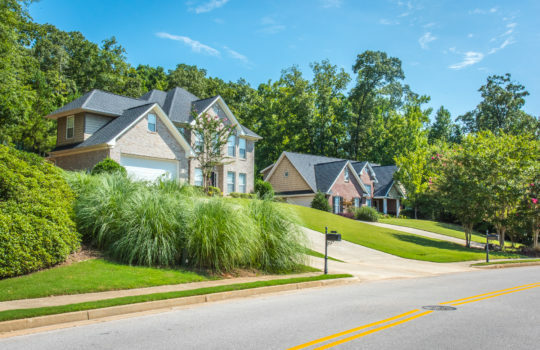 Click on a neighborhood name to see property listings. 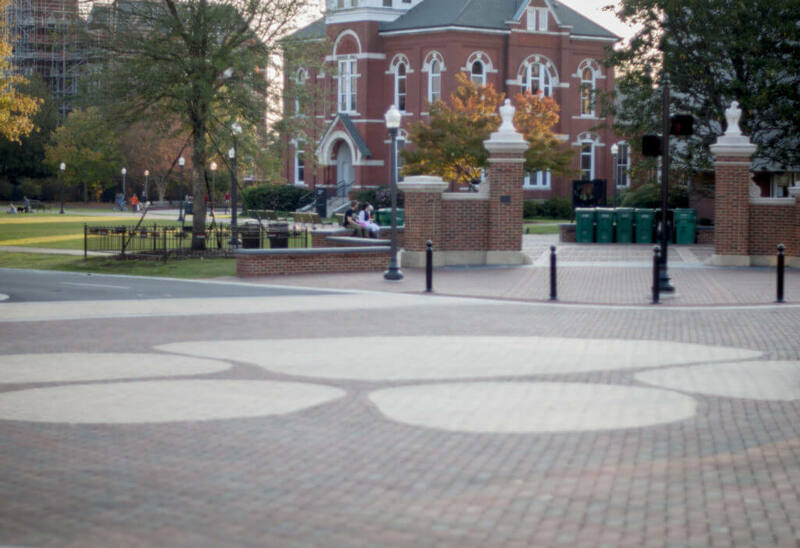 Use the jump list above to quickly navigate. 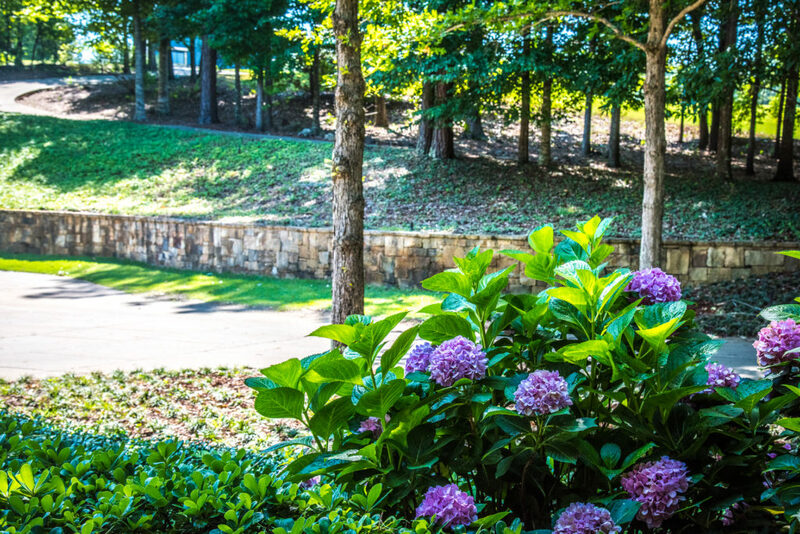 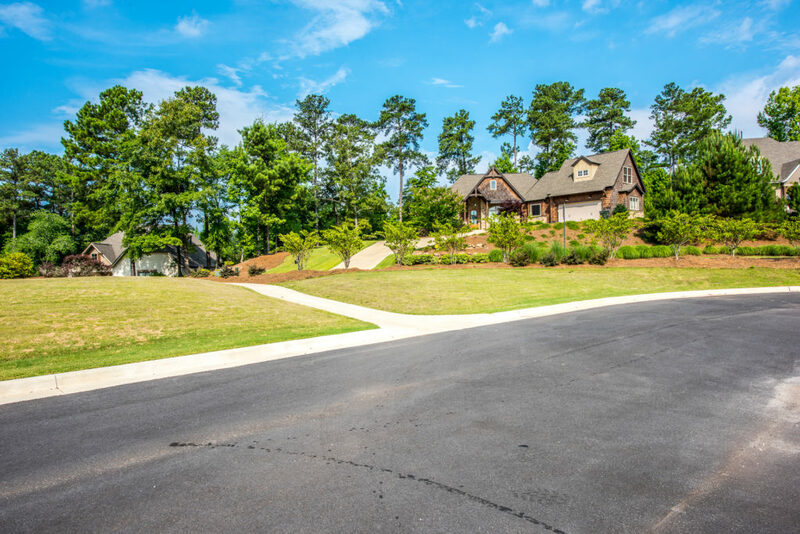 Located off of Highway 280 in Auburn, Asheton Lakes features wooded lots with award-winning custom construction and exceptional amenities including a large community pool with open-air cabana. One of Auburn’s largest neighborhoods, residents enjoy sidewalks that navigate pedestrians along the community’s many lakes. 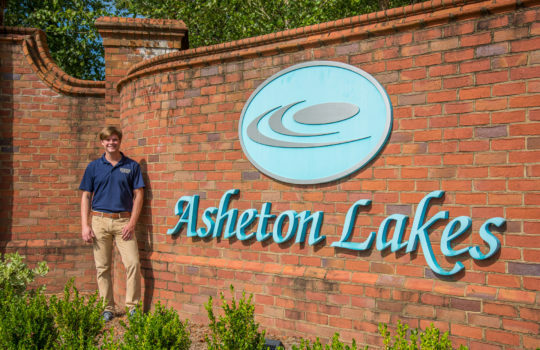 Asheton Lakes was developed in 2003, and prices start around $300,000. 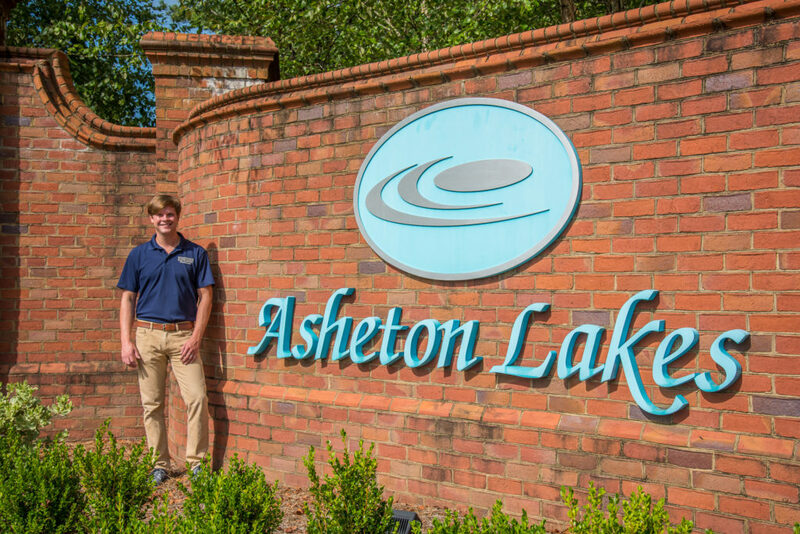 Adjacent to Asheton Lakes, Asheton Park is situated off North College Street in the quiet woods of north Auburn. 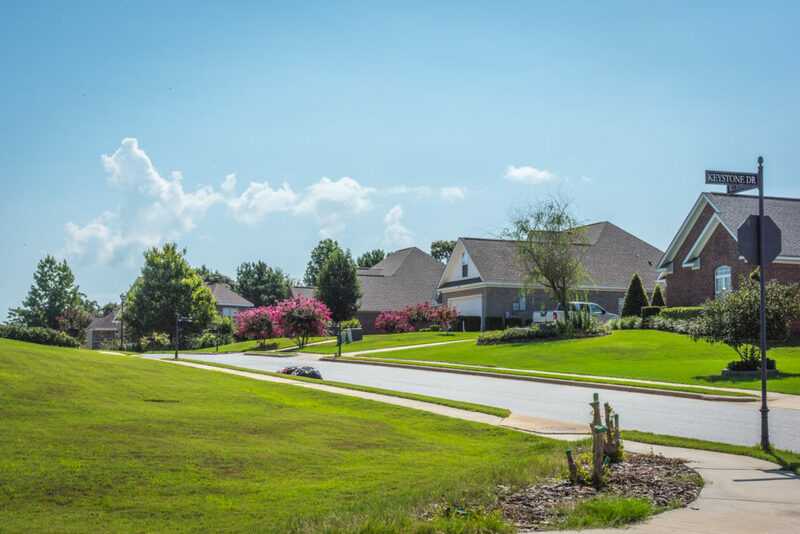 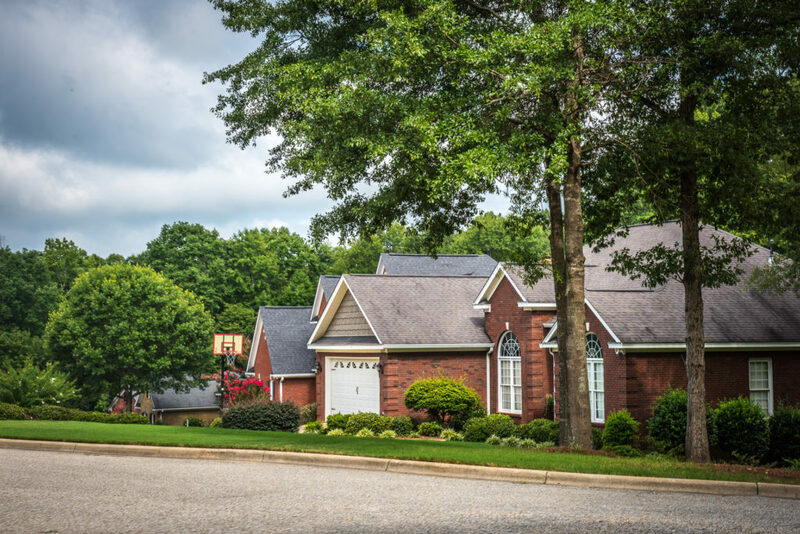 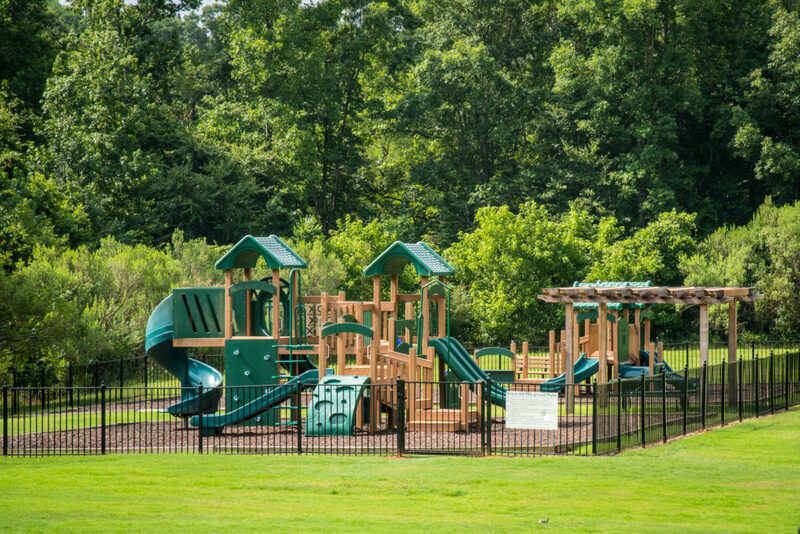 Developed in 1994, Asheton Park places residents in a calm community setting just a few miles from downtown Auburn, Auburn University and Auburn City Schools. 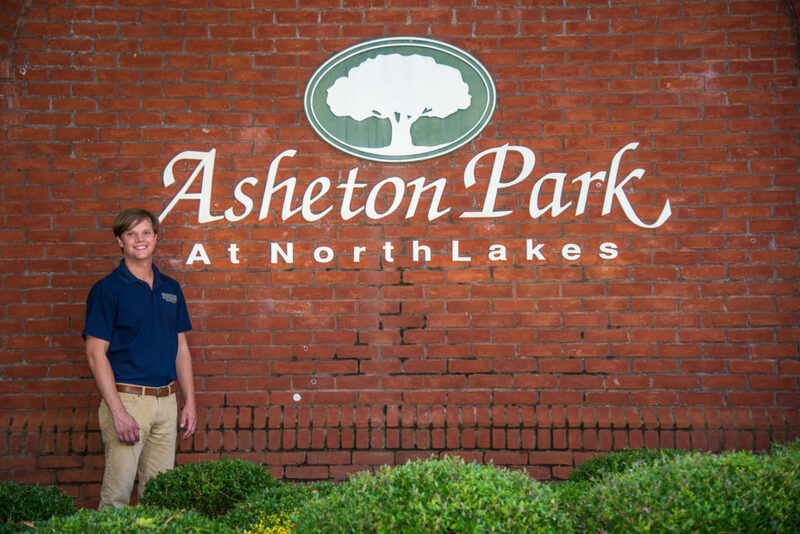 Asheton Park houses 150 homes, and prices start around $300,000. 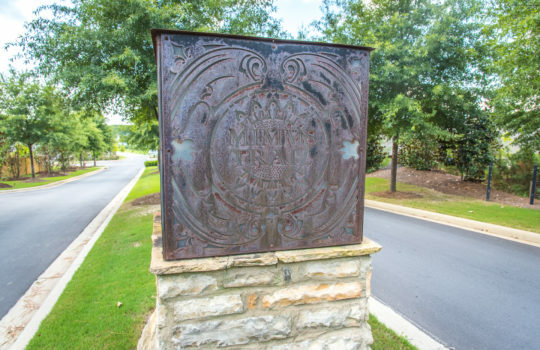 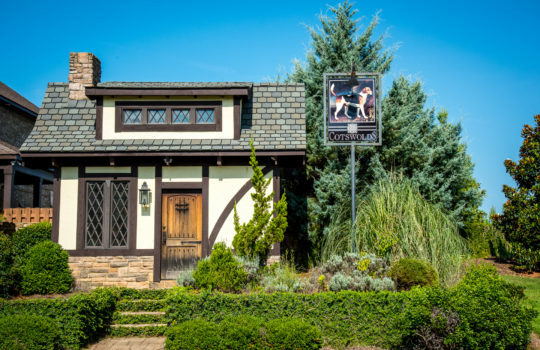 Amenities include a 17 acre park, private swimming pool, children’s pool, tennis courts, Victorian style street lamps and custom-made mailboxes, and signs. 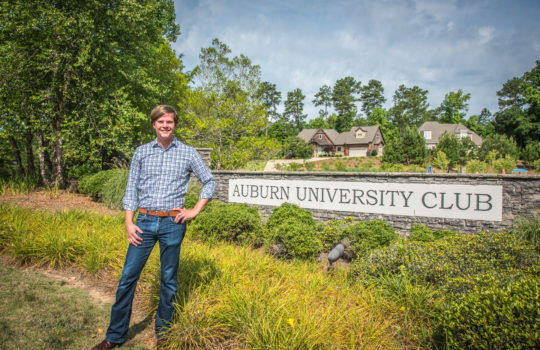 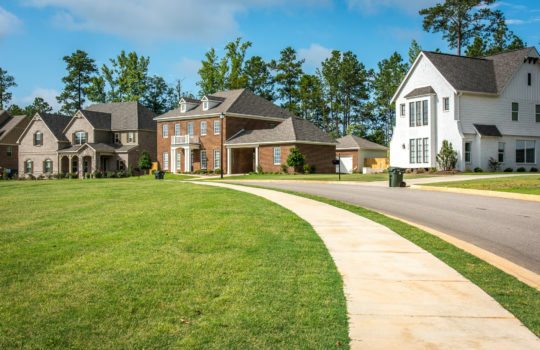 Auburn University Club, established in 1999, encompasses seven distinct developments centrally located in Yarbrough Farms. 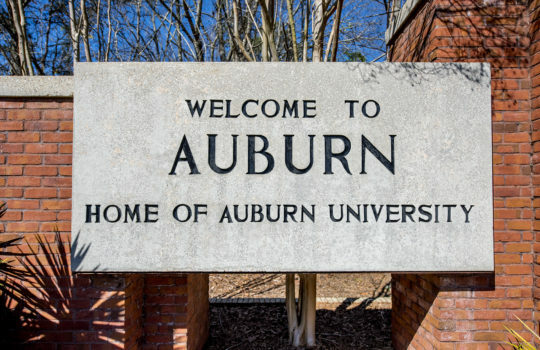 Auburn University Club is on the north side of town and is located in between Yarbrough and Richland elementary schools. 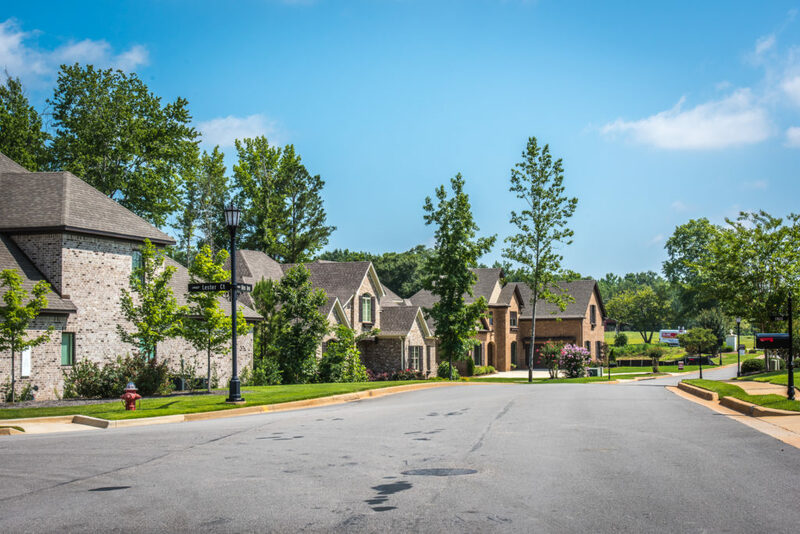 This community features an 18-hole golf course and country club with a 1,200-square foot clubhouse with pool, fitness center, pro shop and full-service restaurant and bar available for members. 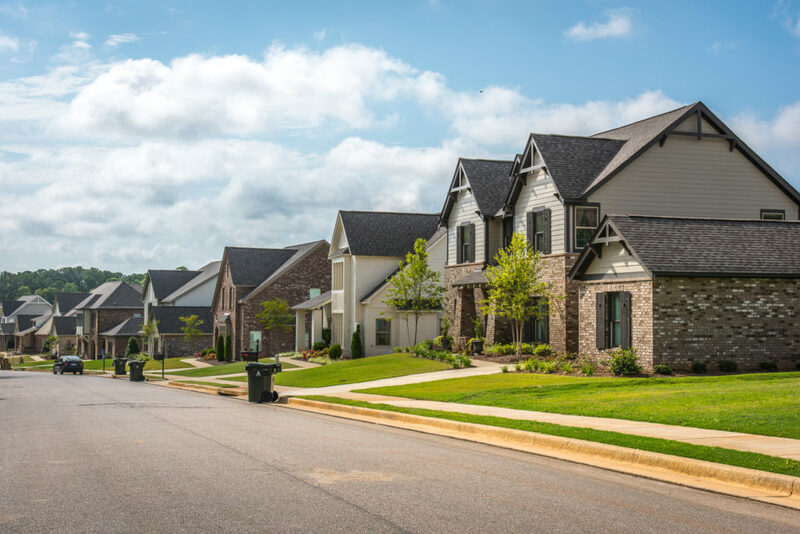 The beautiful Autumn Ridge community located on the north side of Auburn off Farmville Road features craftsman-style, “woman-centric” homes, designed with the idea in mind that women are the sole or primary decision makers in more than 90 percent of home purchases.  Homes built 2010 to present range in size from 1,400 to 2,800 square feet and are priced starting in the $150,000s. 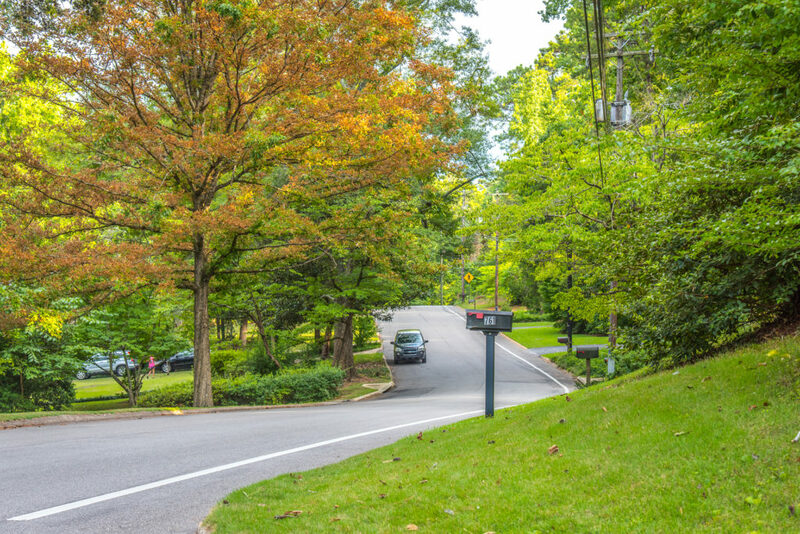 Though the mailing address for Autumn Ridge is Waverly, it is located within Auburn city limits. 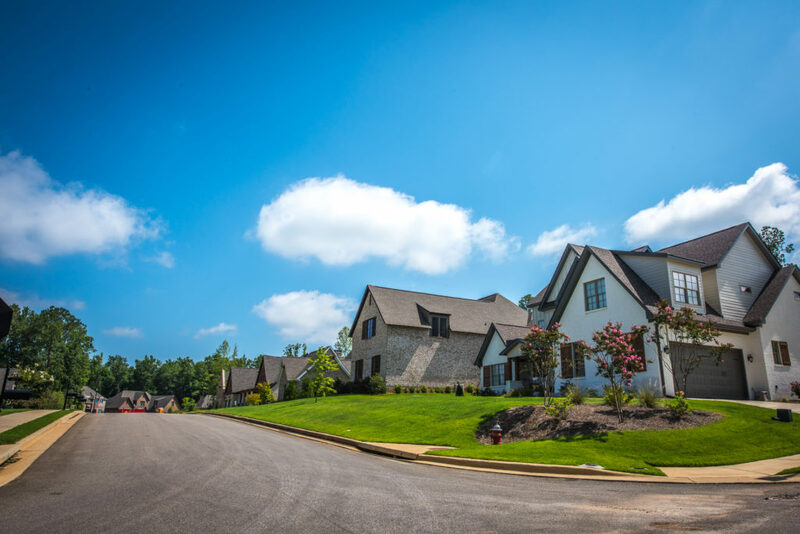 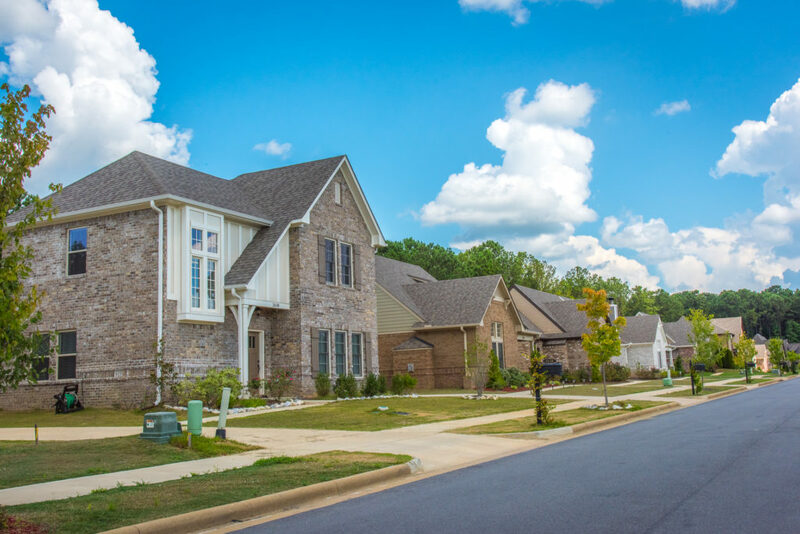 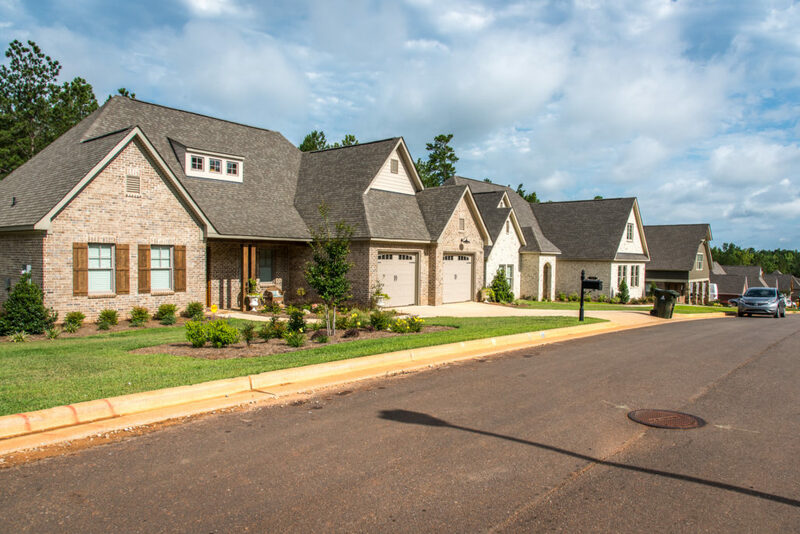 Located off Hamilton Road, Barkley Crest is home to European-inspired brick cottages placed on smaller, low-maintenance lots that start in the upper $200,000s. 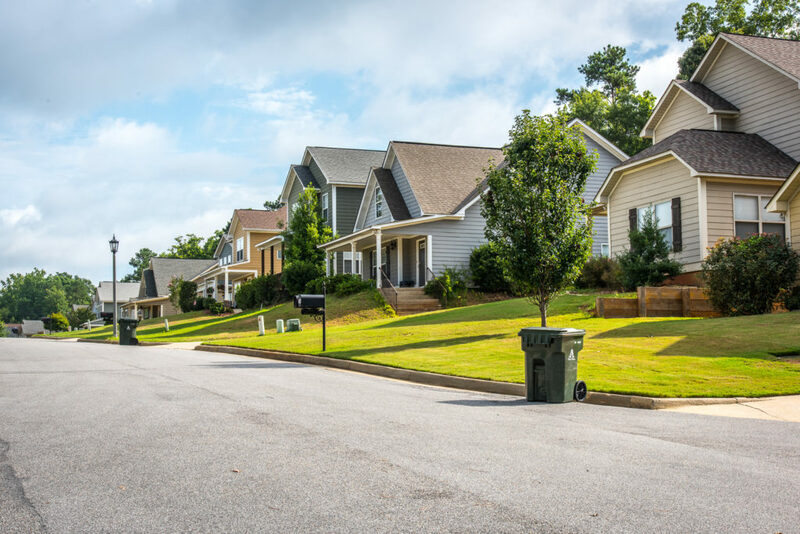 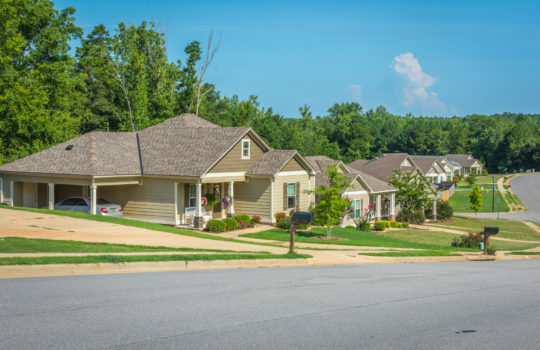 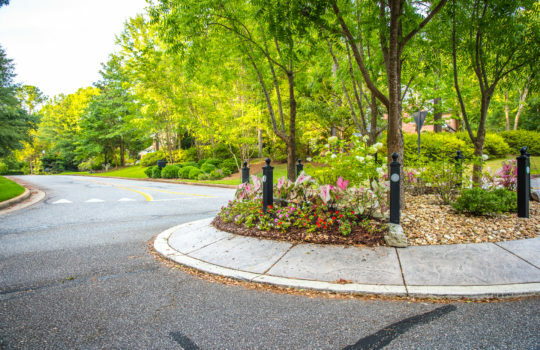 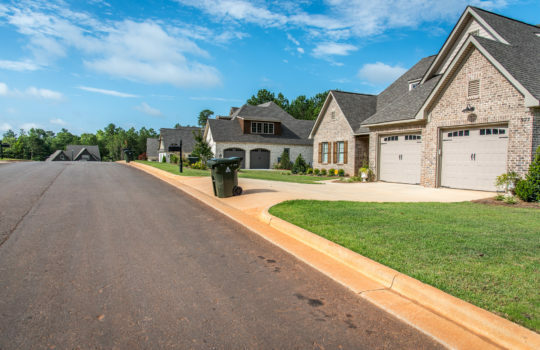 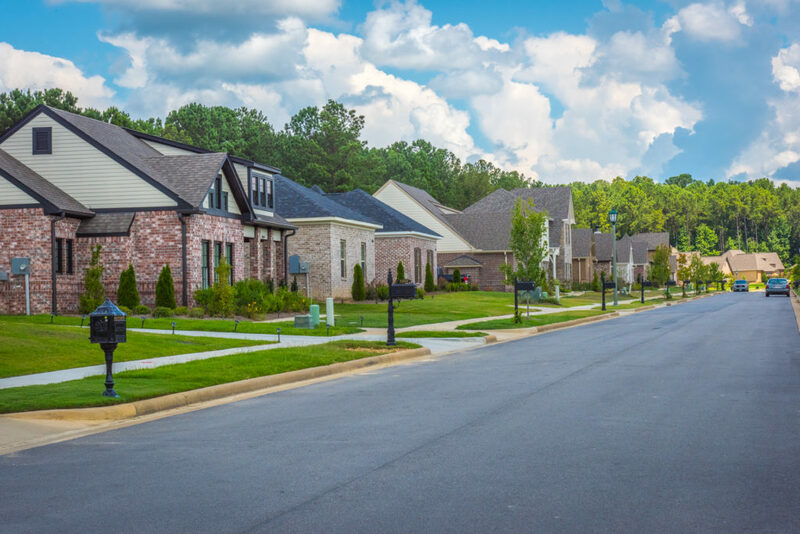 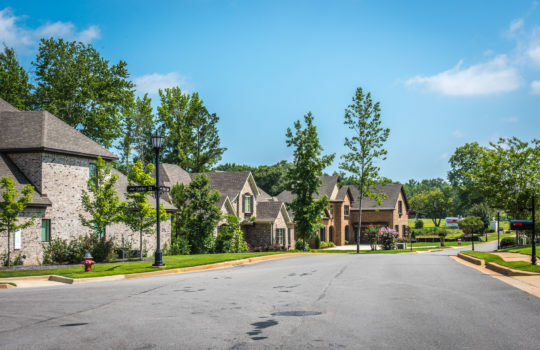 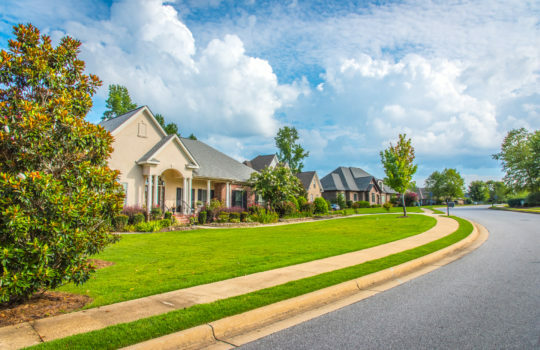 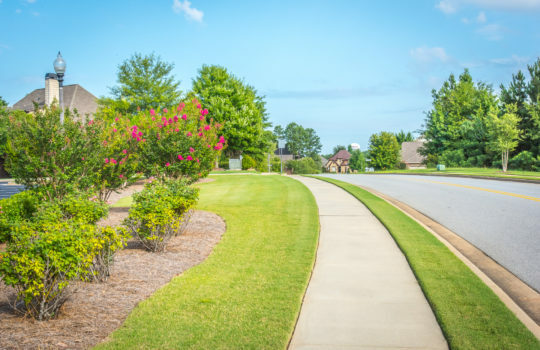 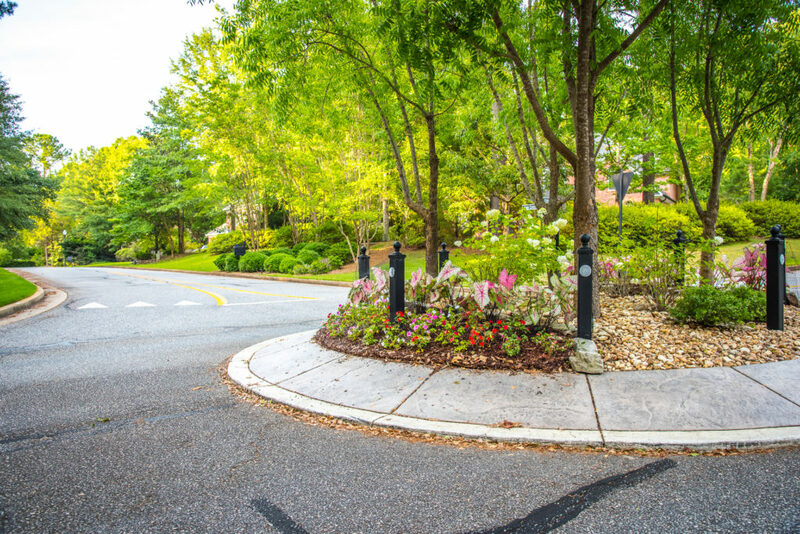 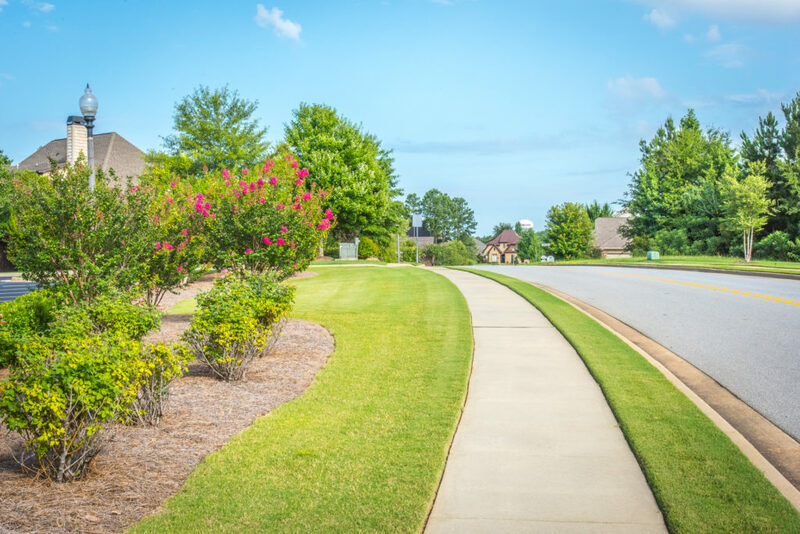 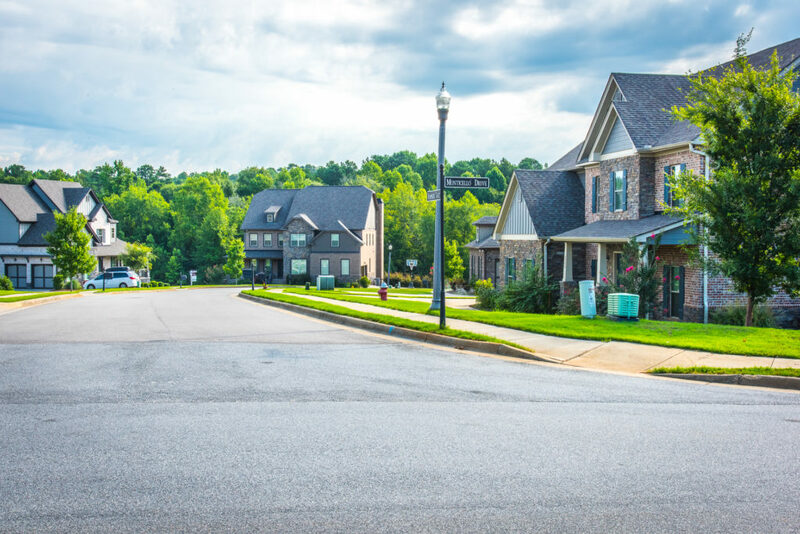 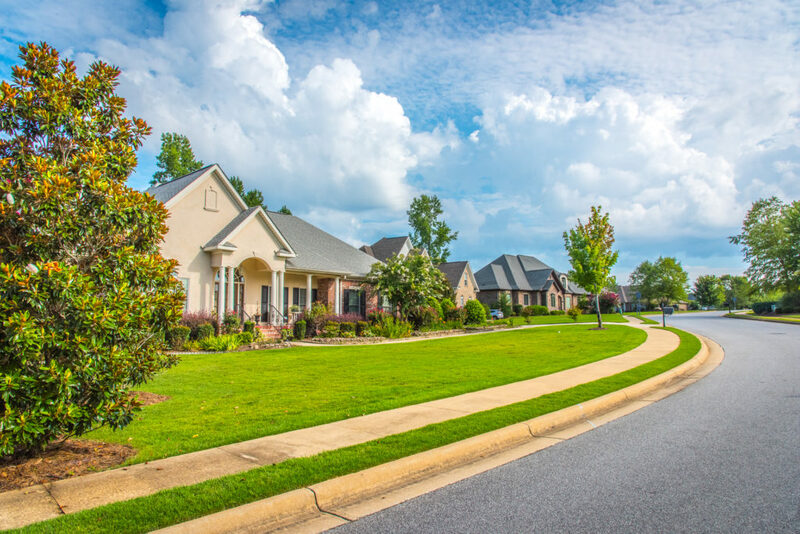 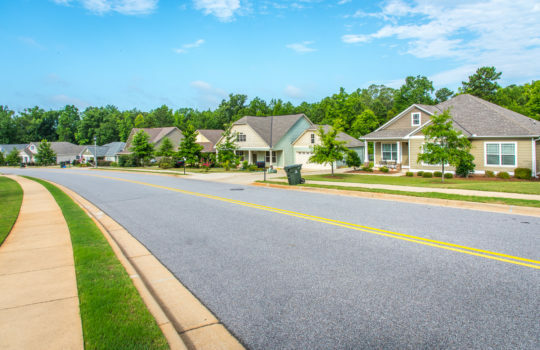 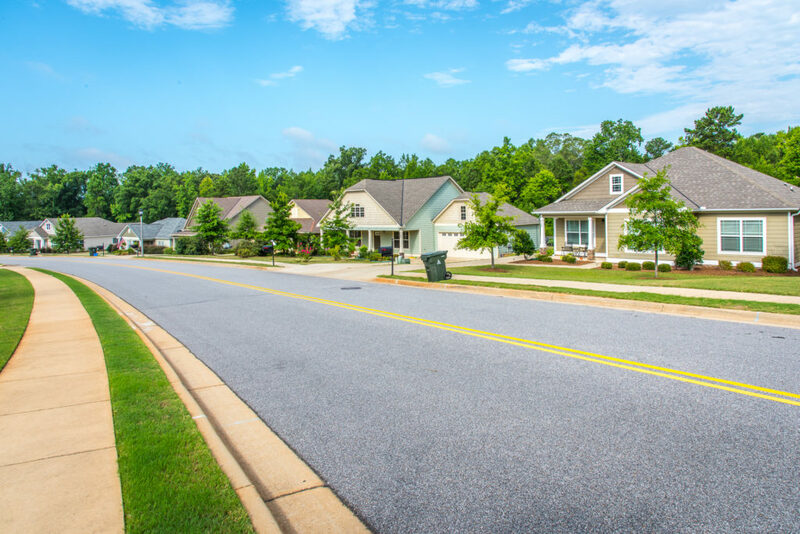 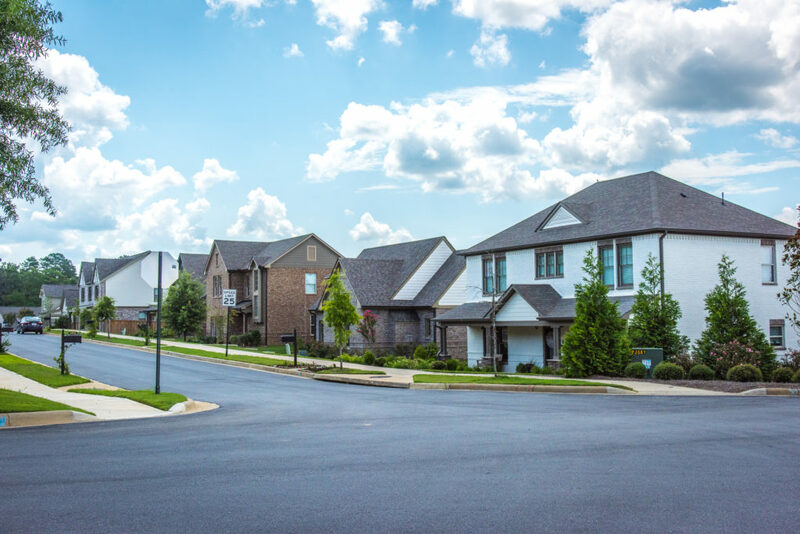 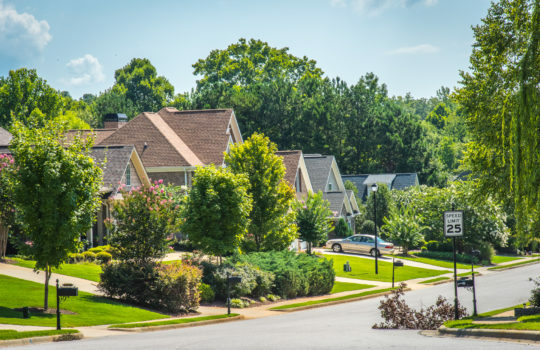 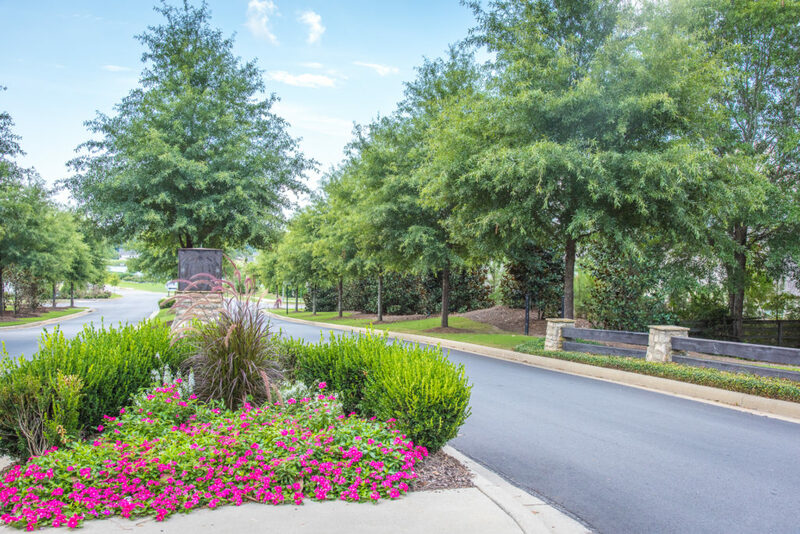 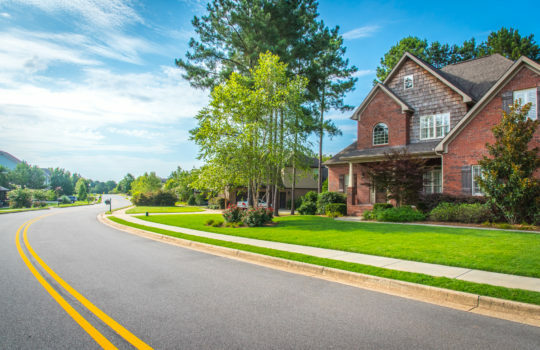 The quaint, charming community has sidewalks throughout that connect to adjoining neighborhoods and Hamilton Place Shopping Center. 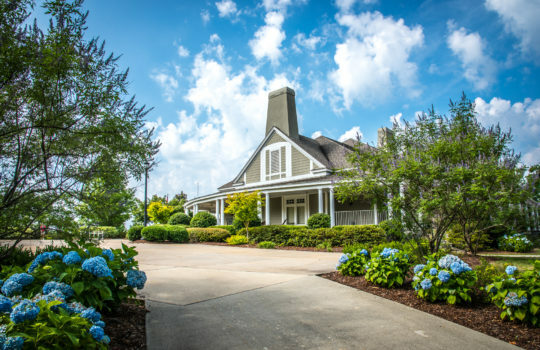 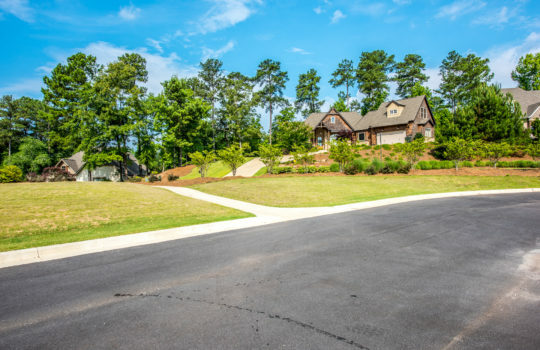 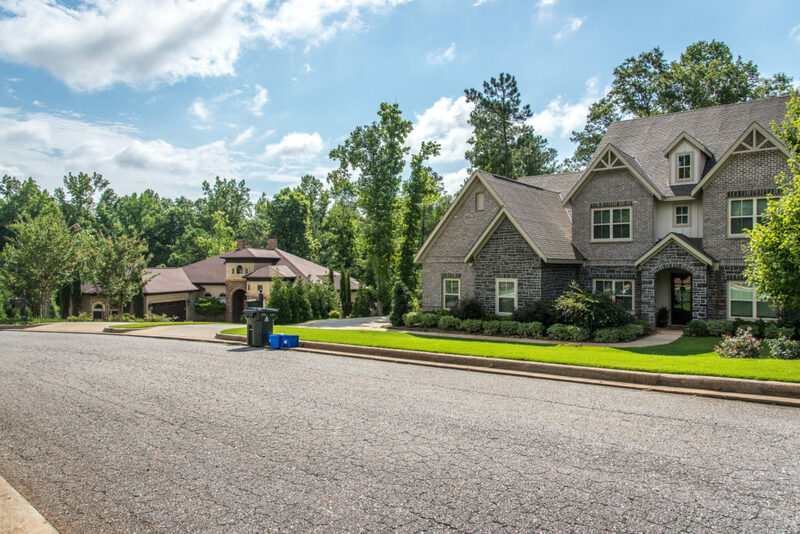 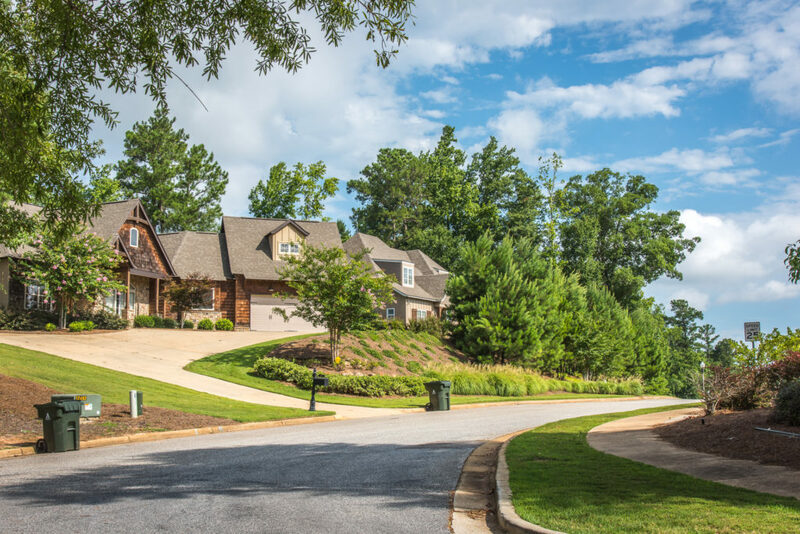 Barkley Crest is strategically placed for the country club enthusiast in between Saugahatchee Country Club and Moore’s Mill Golf Club and Country Club. Enjoy a taste of old-word charm in the exquisite Bent Brooke subdivision off Moore’s Mill Drive. 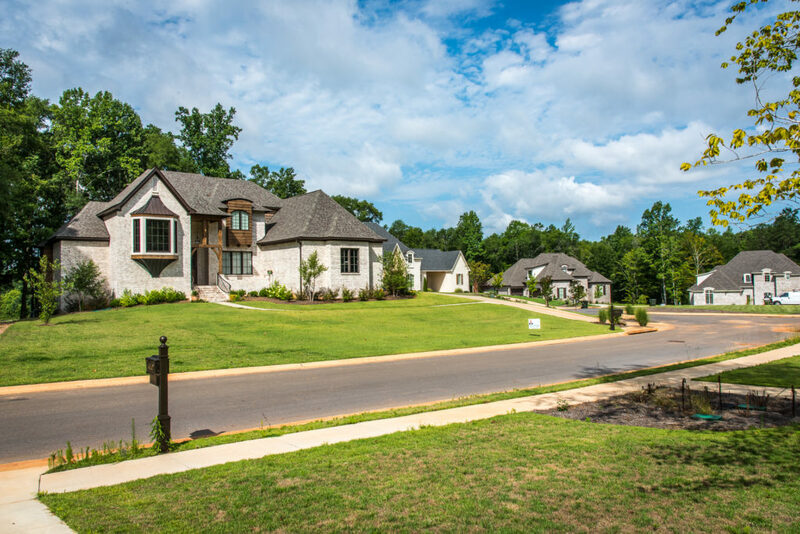 These custom homes, built starting in 2006, range from 2,500 to 5,500 square feet and are priced starting in the mid $400,000s. 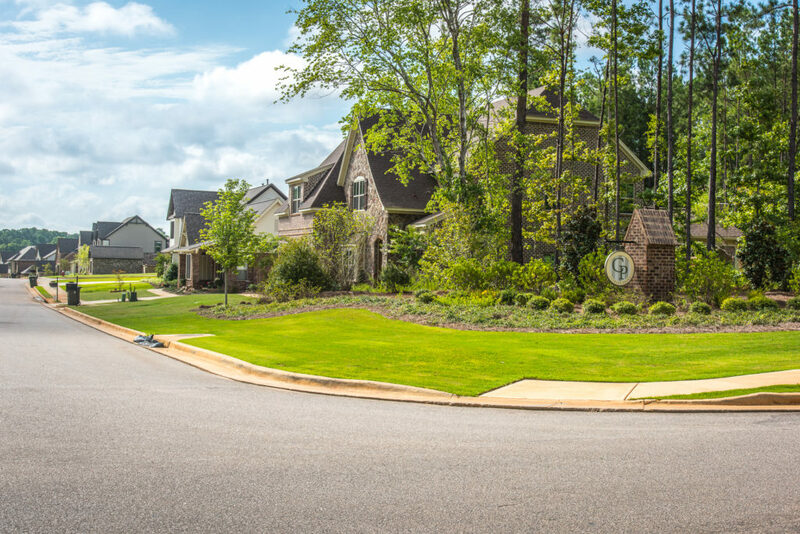 This upscale neighborhood is close to Moore’s Mill Golf Club and Country Club, Saugahatchee Country Club, Tiger Town and Interstate 85. 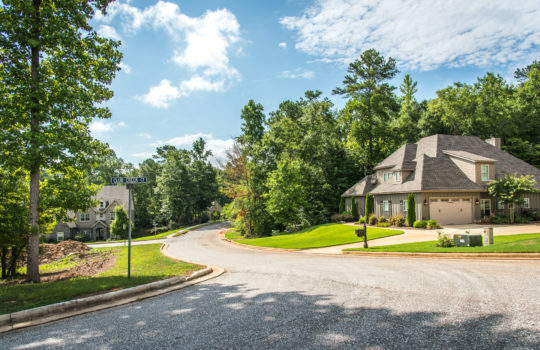 One of Auburn’s largest neighborhoods, Camden Ridge is located off of North Donahue Drive and was first developed in 1992. 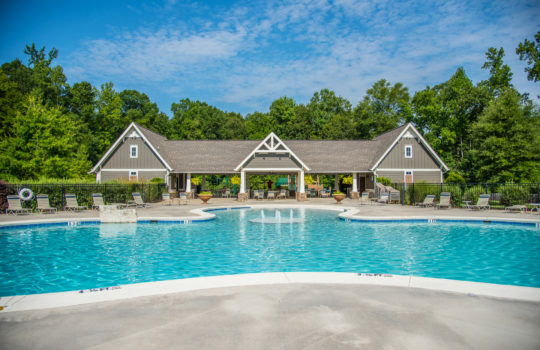 Camden Ridge features a large pool with open-air cabana, clubhouse and community playground. 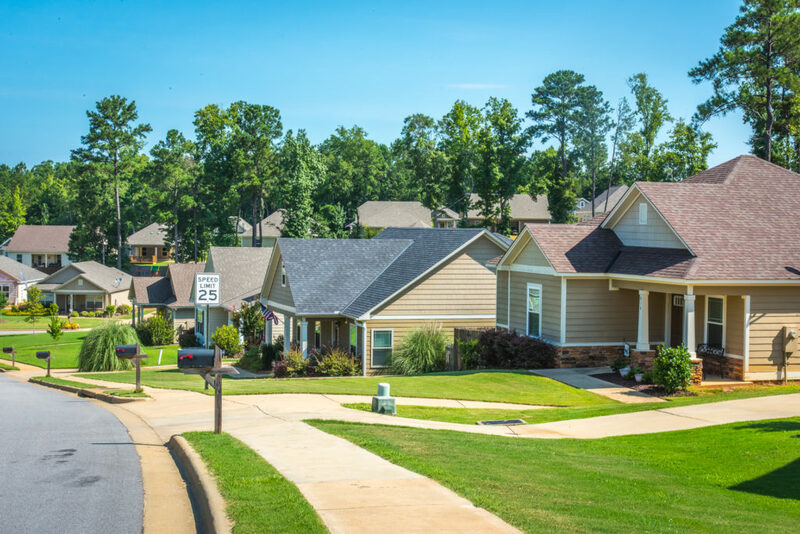 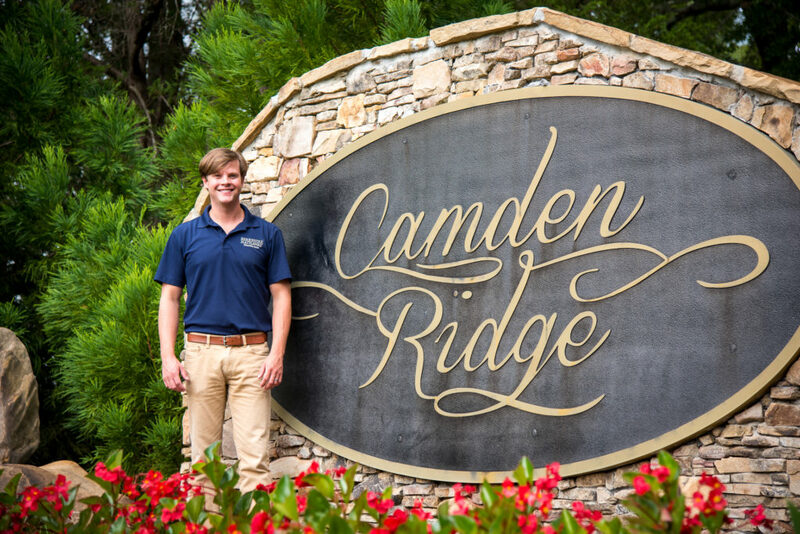 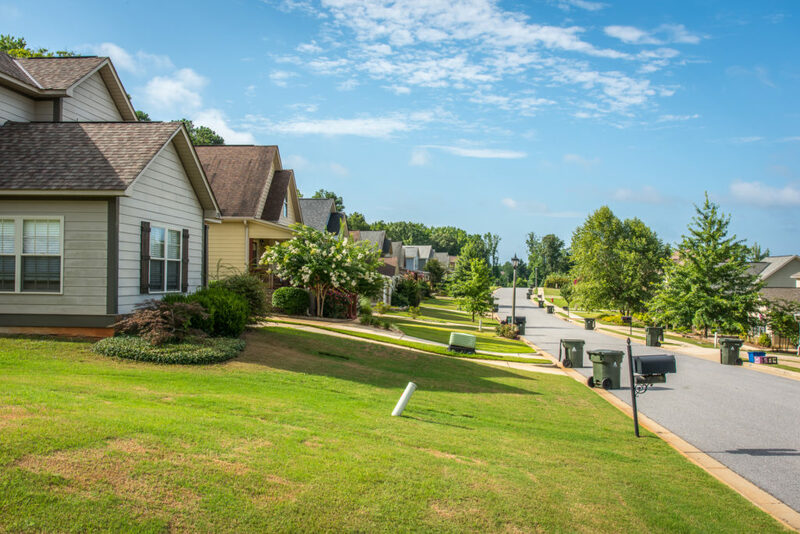 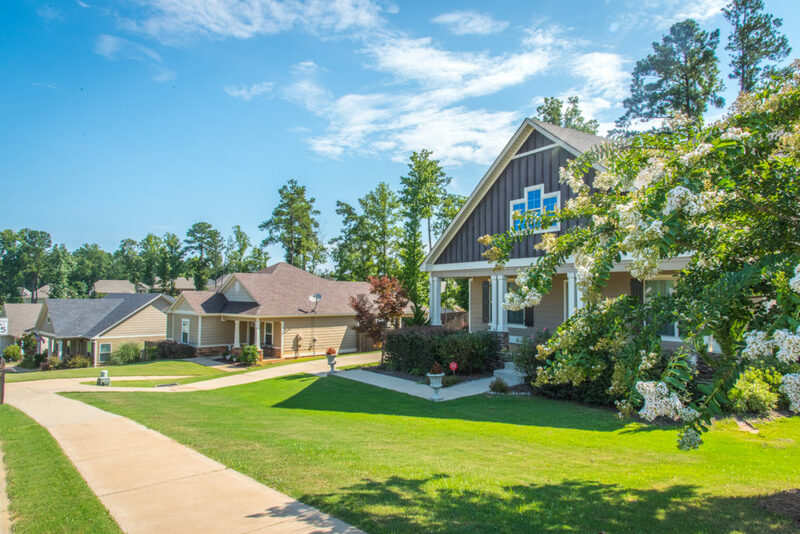 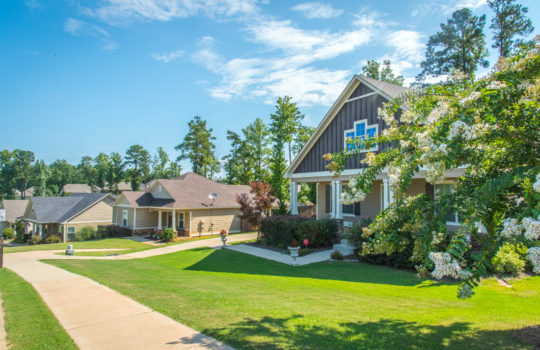 Homes in Camden Ridge start around $190,000 and are in close proximity to Yarbrough Elementary School and Highway 280 and are within a few miles of downtown Auburn and Auburn University. 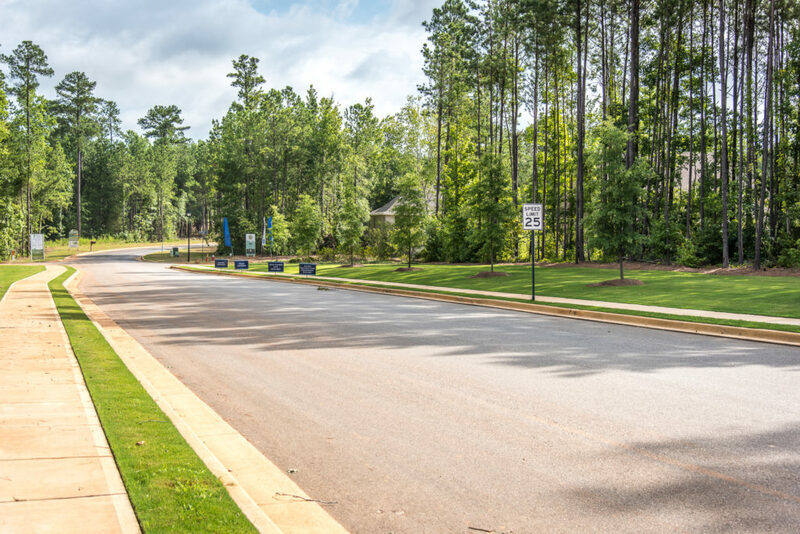 Cary Creek is a 330-acre mixed use development that combines residential and retail opportunities. The Legacy at Cary Creek is a gated, 55-plus community that prides itself on its stately entrance, gas lamps and inviting front porches. 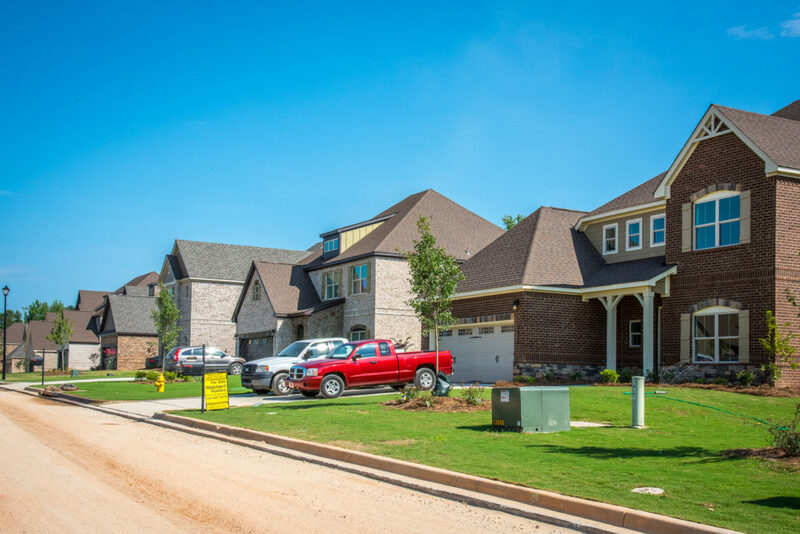 Priced from the high $300,000s to the low $400,000s, homes in The Legacy feature main level living, open accessible floor plans and zero-entry into each home. 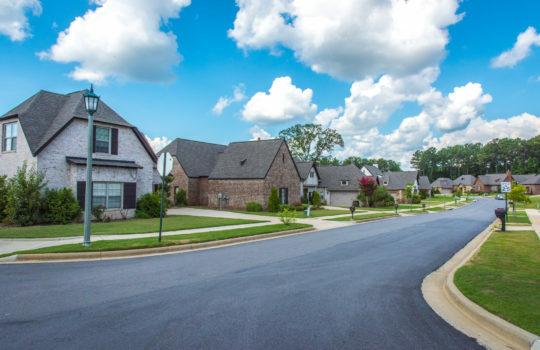 Homes were built starting in 2014 to present. 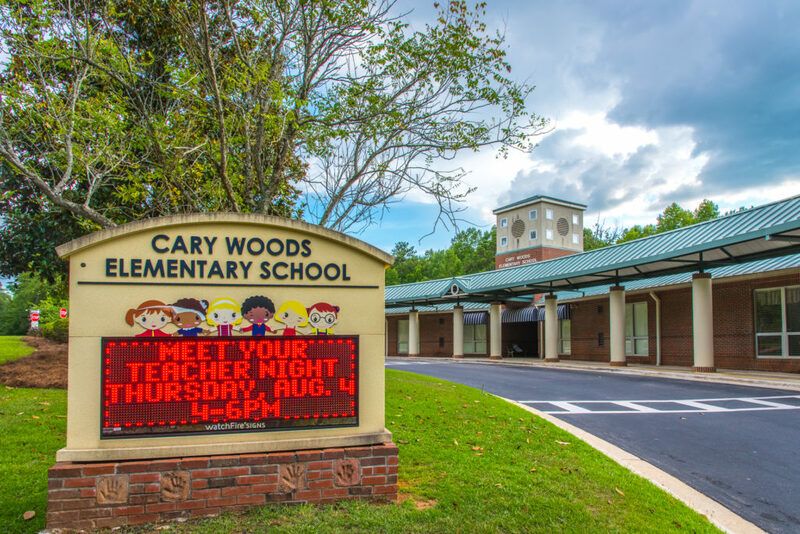 Cary Woods boasts older charm combined with contemporary homes and some new construction to offer something to suit all tastes. 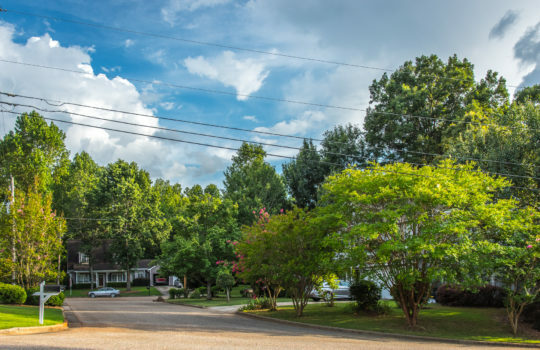 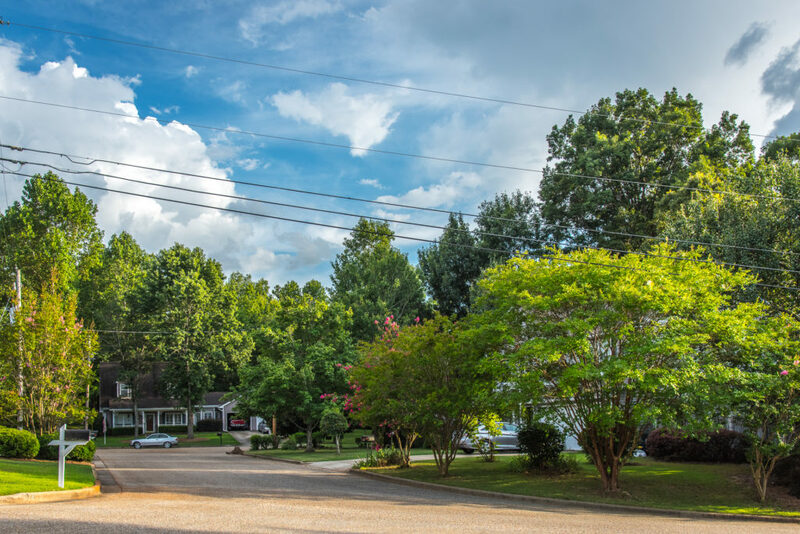 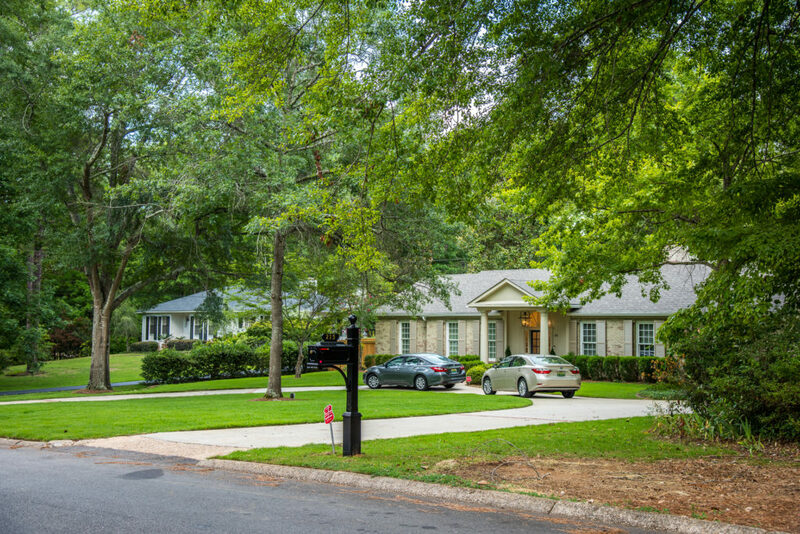 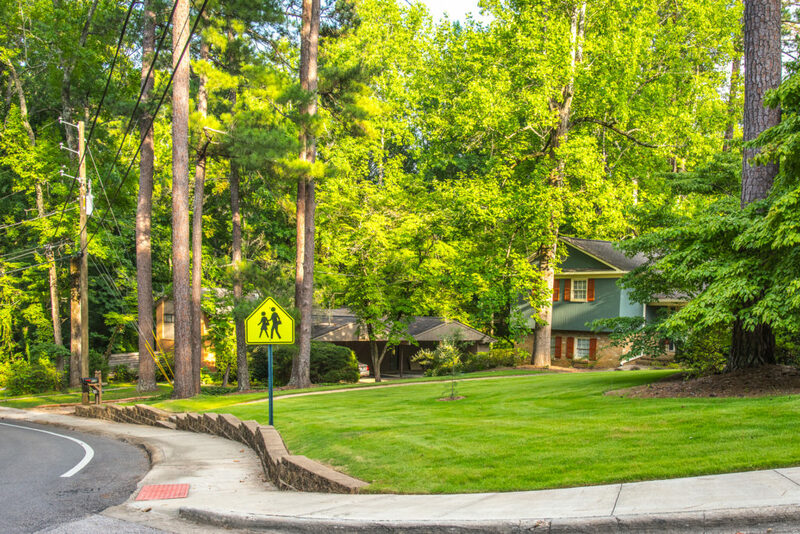 Homes built from the early 1950s to present and priced starting in the mid $140,000s are nestled among mature trees and full azaleas lining wide streets perfect for an afternoon stroll or bike ride. In addition to homes, Cary Woods houses Hickory Dickory Park and Cary Woods Elementary School. 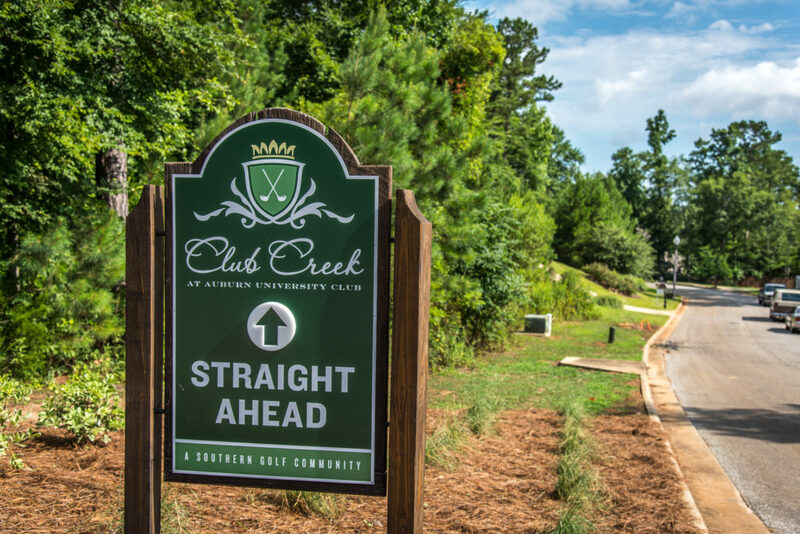 Creekside living complemented by quick access to city culture describes Club Creek at Auburn University Club. 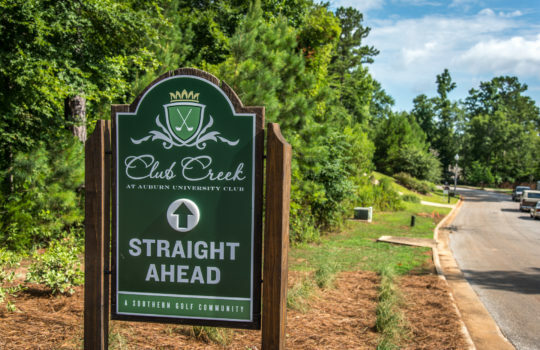 With 44 home sites bordering Saugahatchee Creek or the 11th fairway of the Auburn University Club Golf Course, Club Creek’s homes will be custom-constructed by local, award-winning builders. Residents will have access to all of the amenities of the Auburn University Club, which features a 12,000 square-foot clubhouse, pool, tennis facility and restaurant. 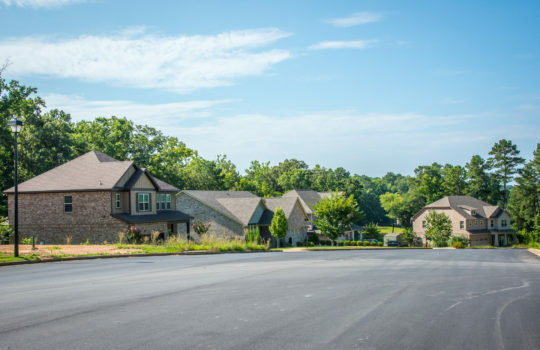 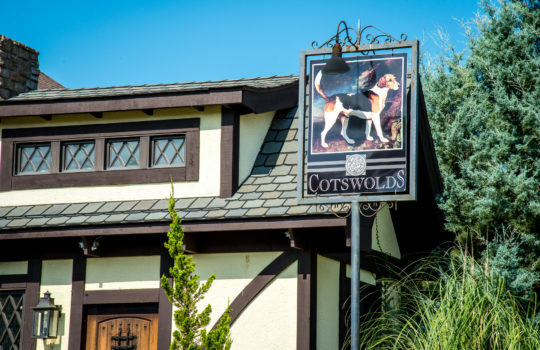 Conveniently located near Auburn’s Richland Elementary School and Yabrough Tennis Center off Richland Road, The Cotswolds retains an aura of small English village charm while celebrating Auburn as a growing community with modern-day energy efficient designs. The neighborhood features European-inspired architecture in homes between 2,500 and 4,300 square feet. 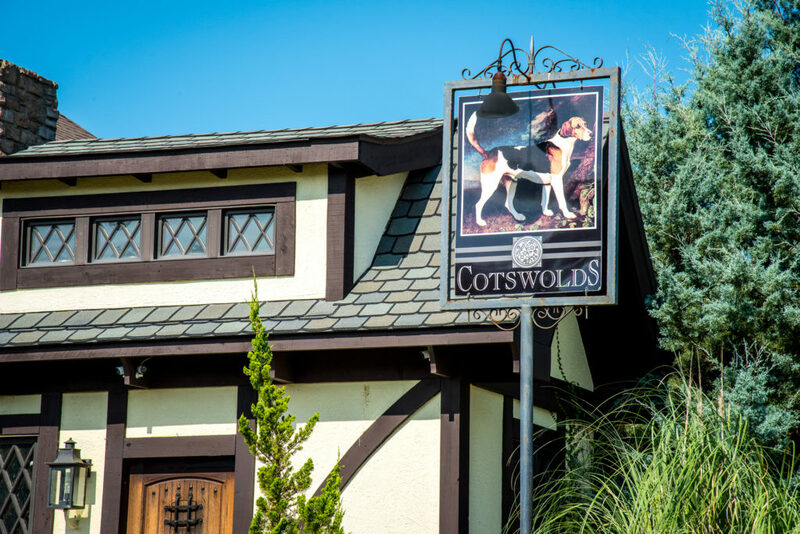 Established in 2007, The Cotswolds includes homes that start around $270,000. 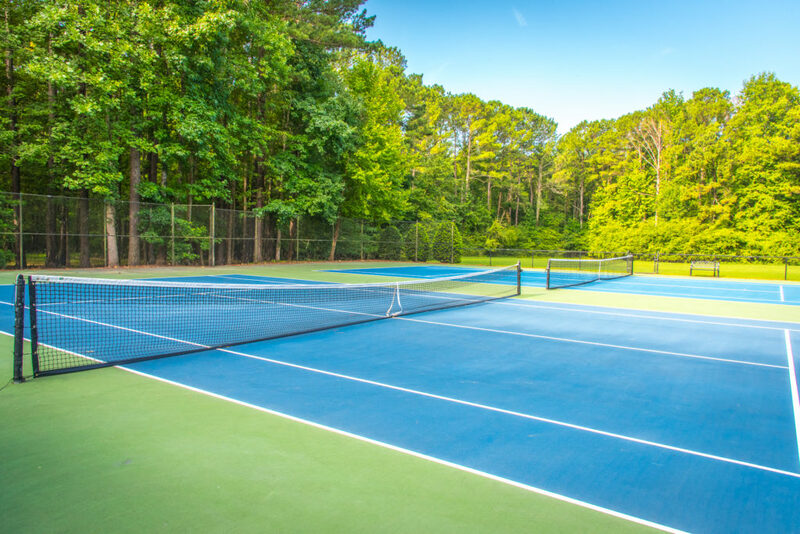 Located across the street from Richland Elementary School and Auburn’s Yarbrough Tennis Center, Cypress Point at Auburn University Club is a new development that promotes leisure and luxury within a moderate price range. With the first home in the development built in 2013, Cypress Point’s houses range from $260,000 to $459,000. 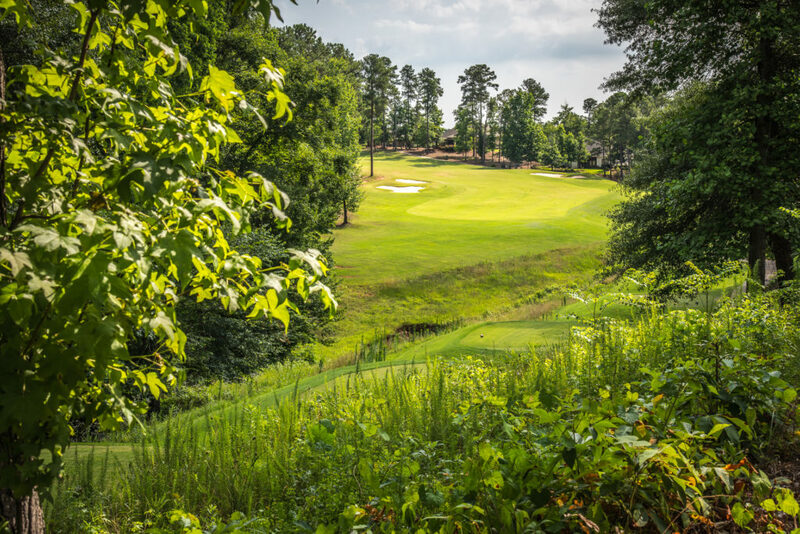 Cypress Point backs up to the fifth hole on the Auburn University Club Golf Course. 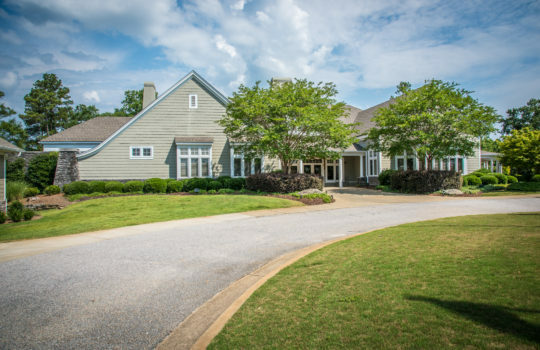 Cypress Point homeowners enjoy free access to the Auburn University Club. 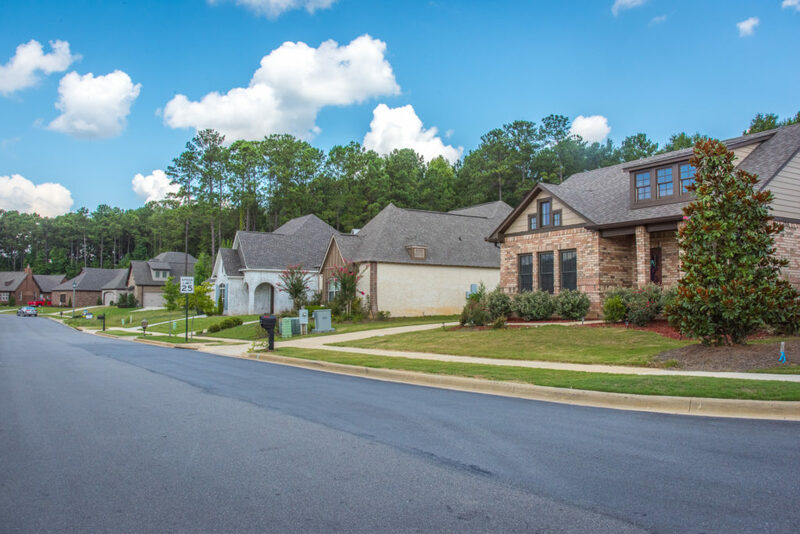 Donahue Ridge is a smaller subdivision off North Donahue Drive that offers a variety of floorplans at moderate prices from the upper $100,000’s to the lower $200,000’s. Craftsmen-built homes constructed 2009 to present are available in three-, four- and five-bedroom layouts on expansive lots and feature characteristics like granite countertops, wood flooring and rock accent exteriors. 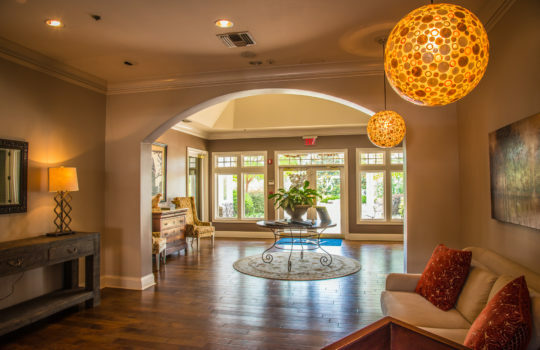 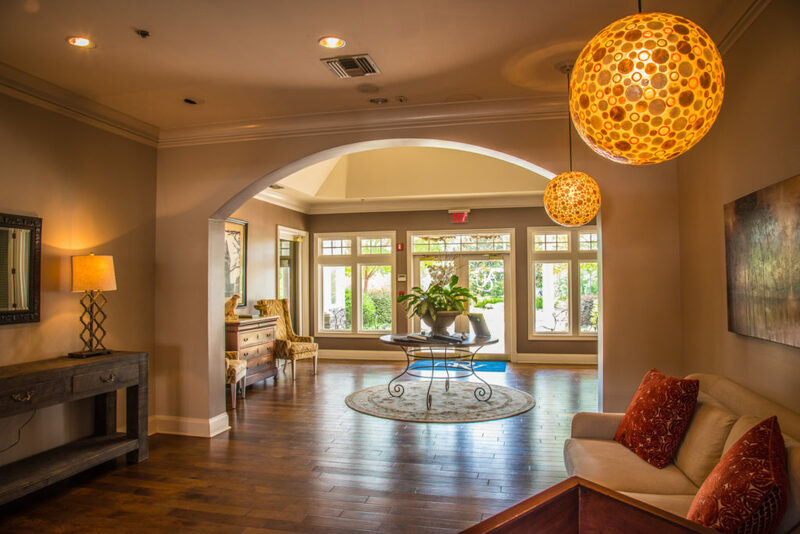 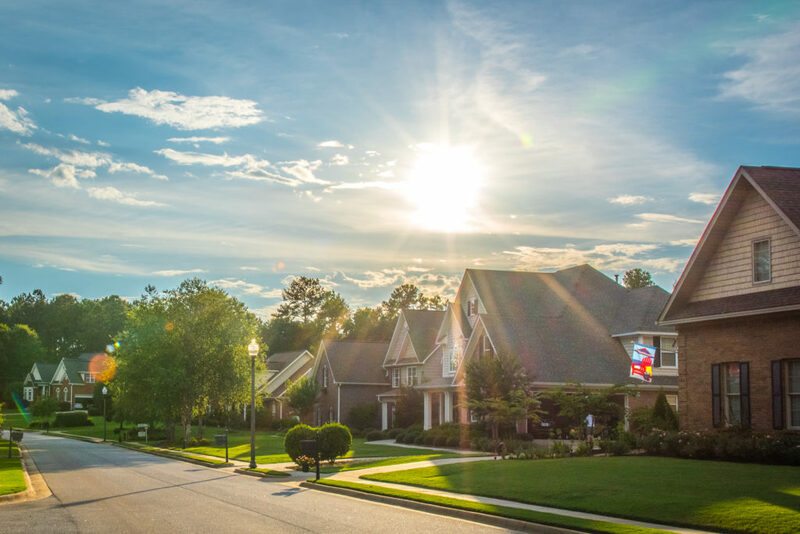 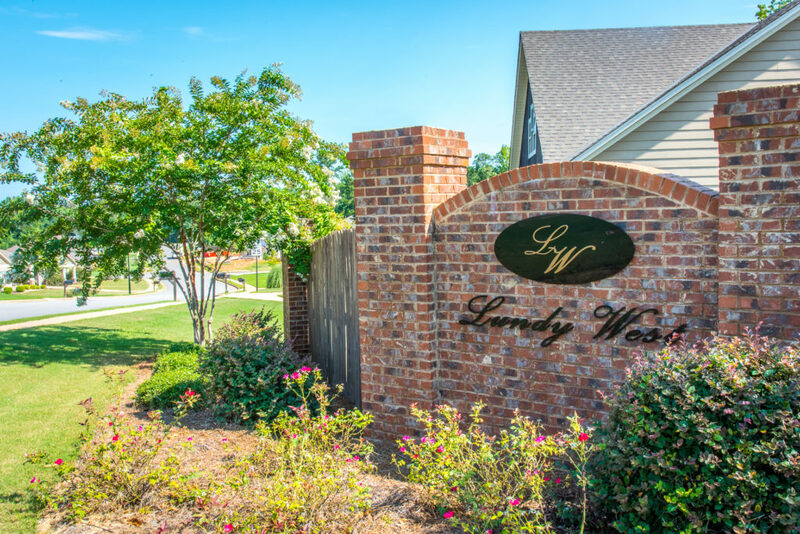 Find your home in the heart of The Loveliest Village. 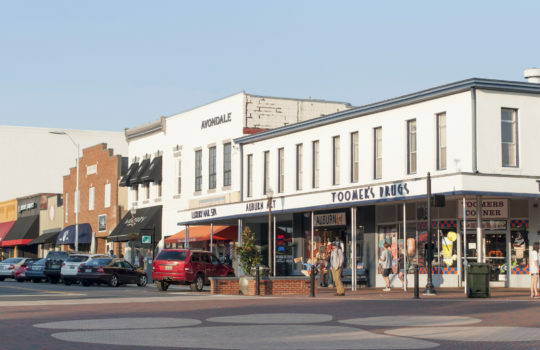 Be right in the middle of the action with a variety of living options in downtown Auburn, ranging from upscale condos with stunning vistas of the Plains to charming historic homes. 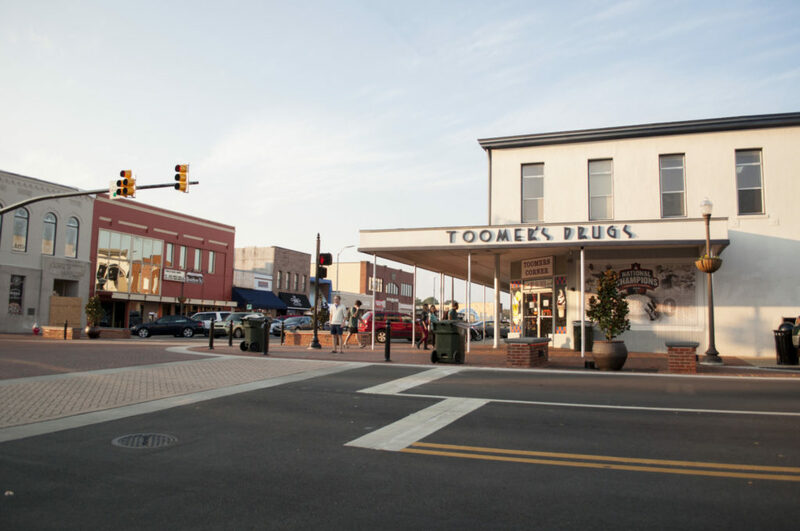 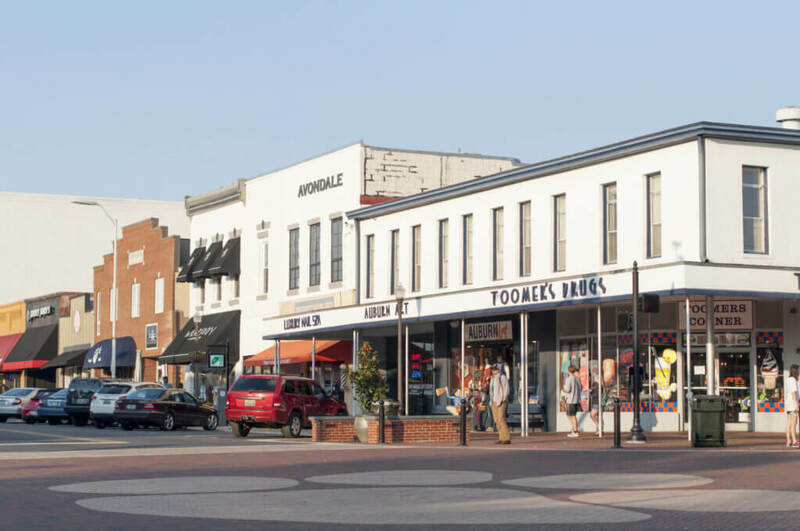 Enjoy living in walking distance of downtown restaurants, shops and bars, as well as the iconic Toomer’s Corner and Samford Hall. 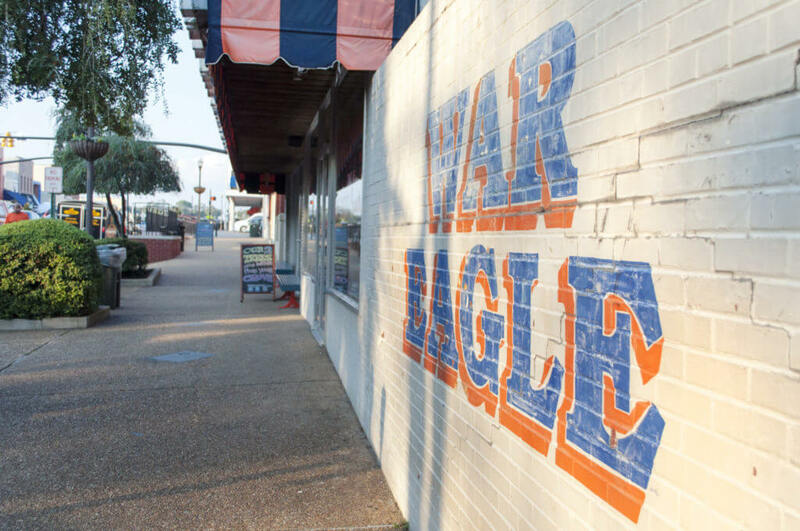 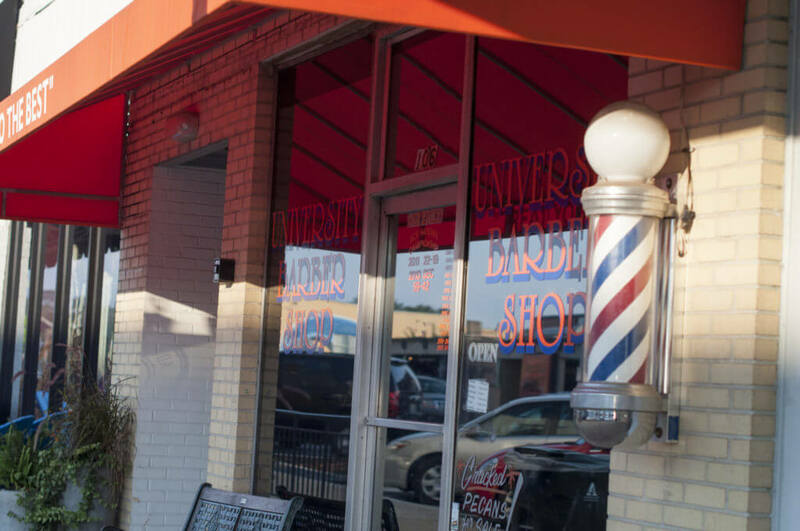 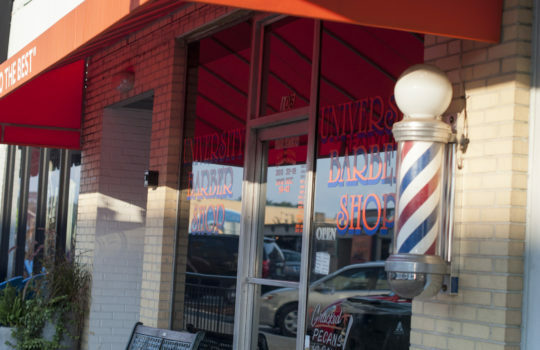 In downtown Auburn, you can thrive on an urban feel minus the headaches of a metropolitan environment. 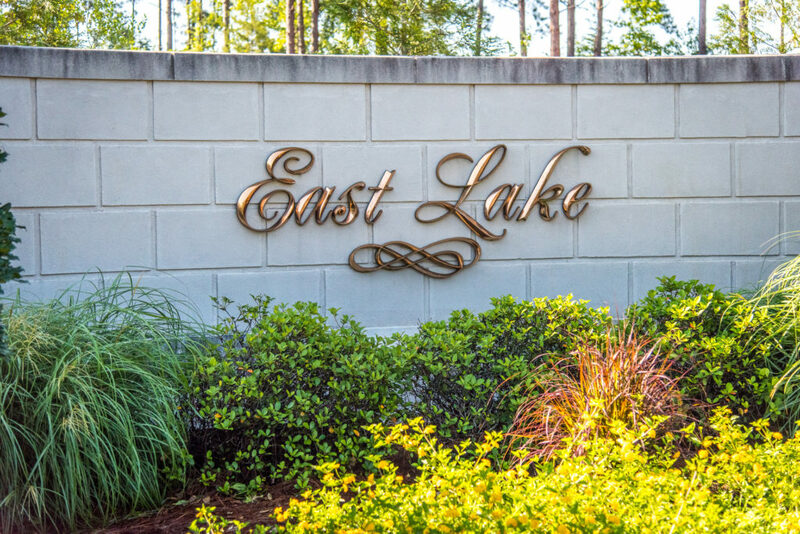 Located off of Moore’s Mill and Ogletree roads on the south side of Auburn, homes in East Lake start at prices around $400,000. 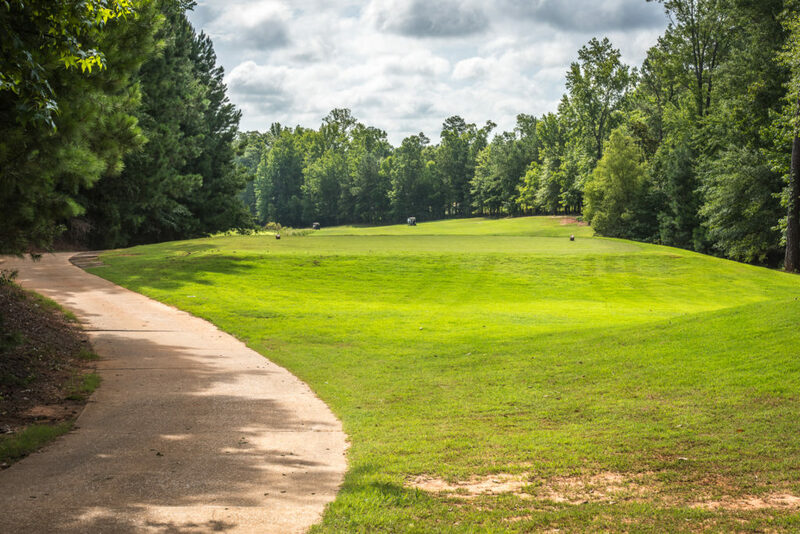 Less than a mile from Ogletree Elementary School and Moore’s Mill Golf Course and Country Club, East Lake is an easy drive to Tiger Town, Interstate 85, Saugahatchee Country Club and Auburn University. 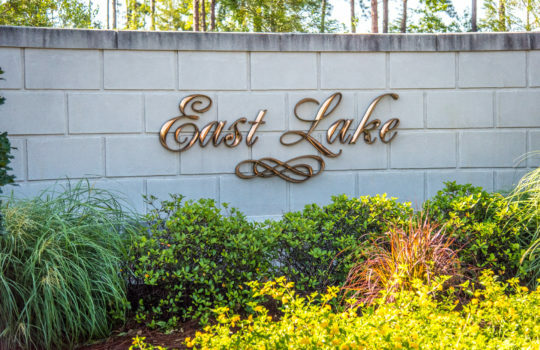 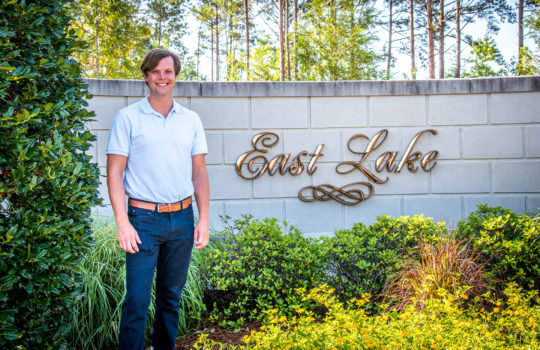 East Lake’s stately entrance invites residents to amenities like sidewalks, picturesque lakes, a community pool and clubhouse. 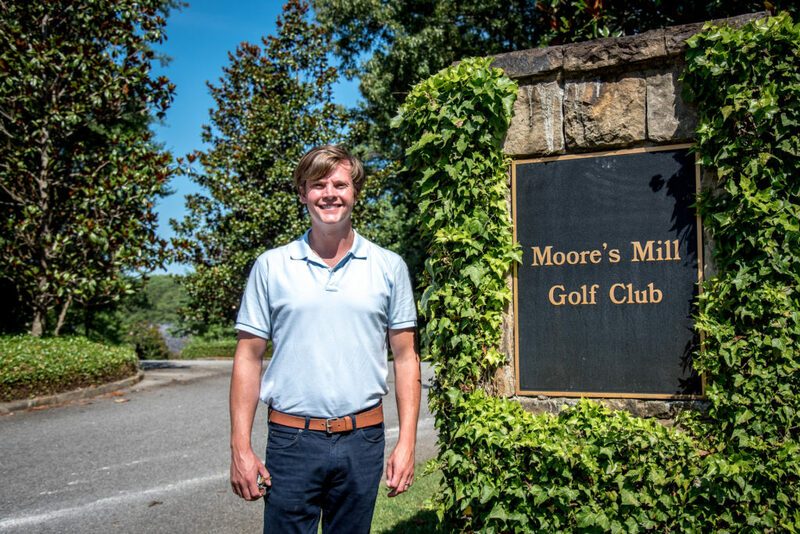 Lot purchases also include a social membership waiver at Moore’s Mill Country Club. 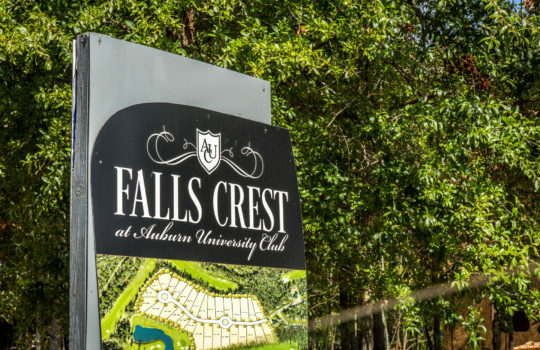 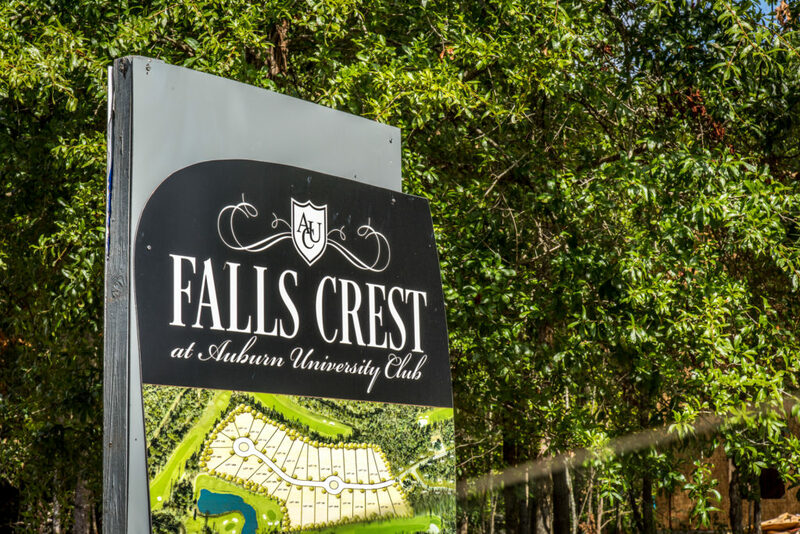 Falls Crest at Auburn University Club is defined by its 31 golf course home sites neatly placed along the rolling greens of the Auburn University Club Golf Course on the 12th, 13th, 16th, 17th and 18th holes. Each home was crafted by a local custom builder, and homes range between $450,000 and $800,000. 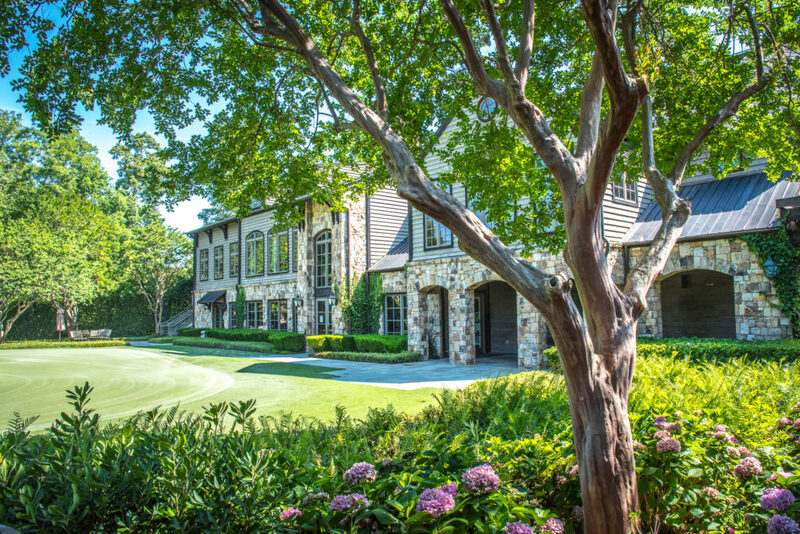 The luxury of a custom home coupled with outstanding amenities makes for golf course living like no other. 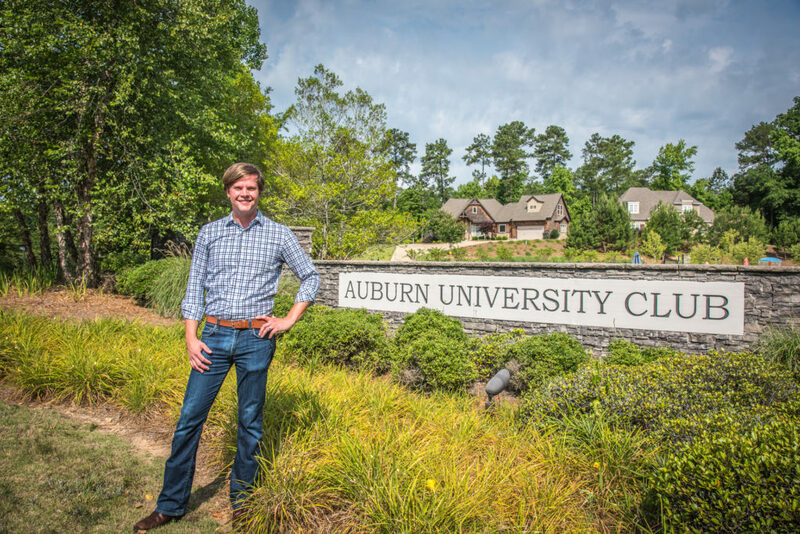 Homeowners enjoy access to the Auburn University Club, which features a 12,000 square-foot clubhouse, pool, tennis facility and restaurant. 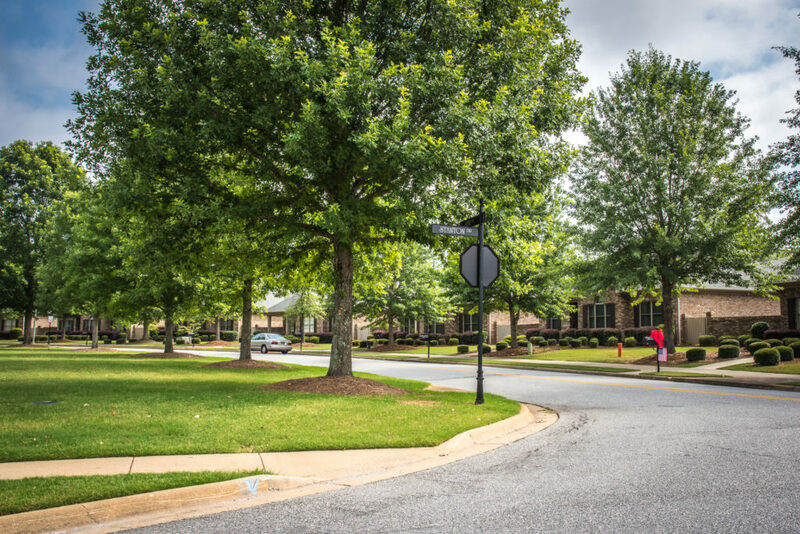 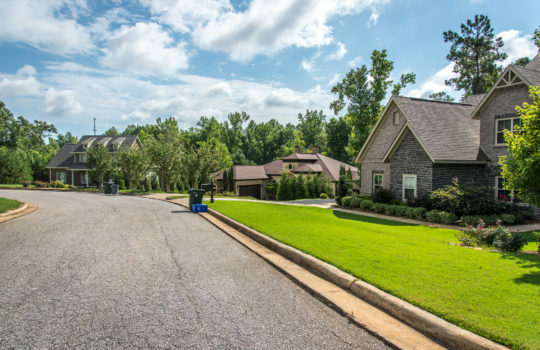 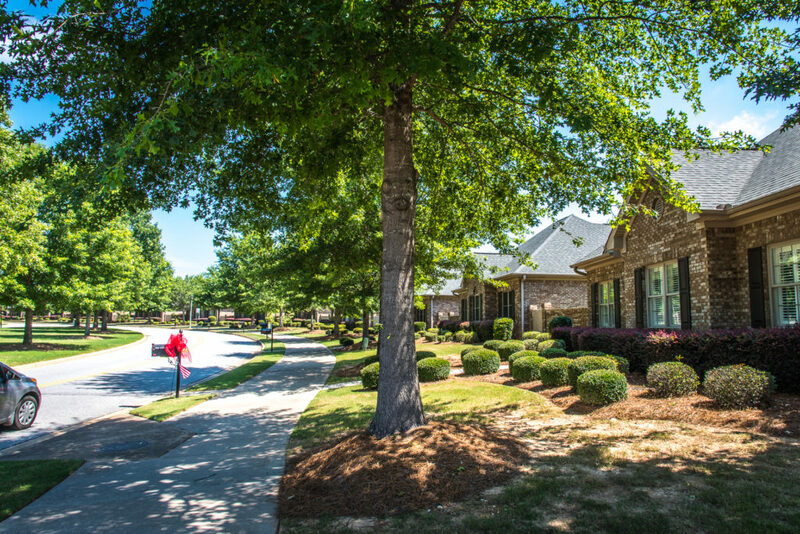 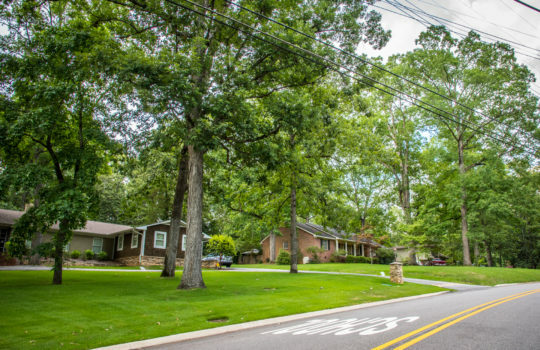 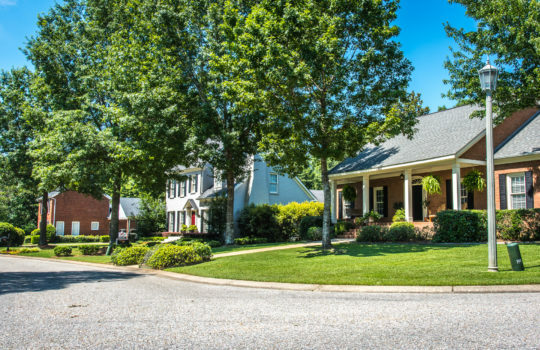 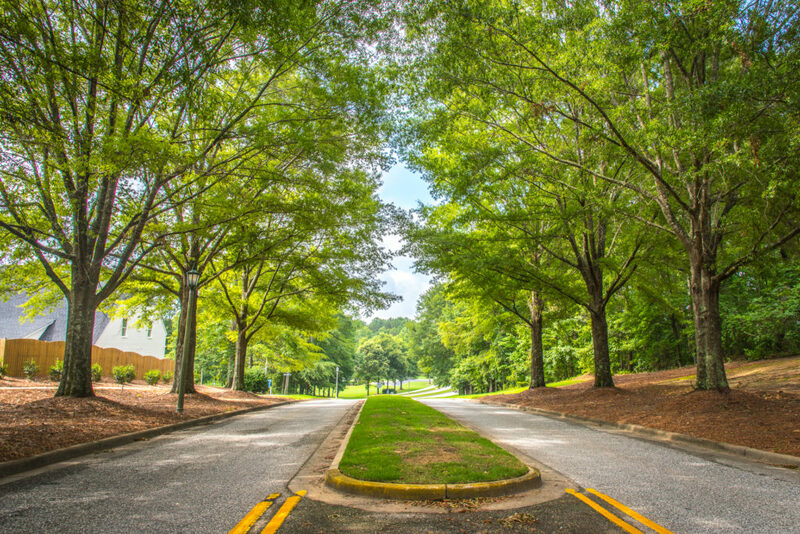 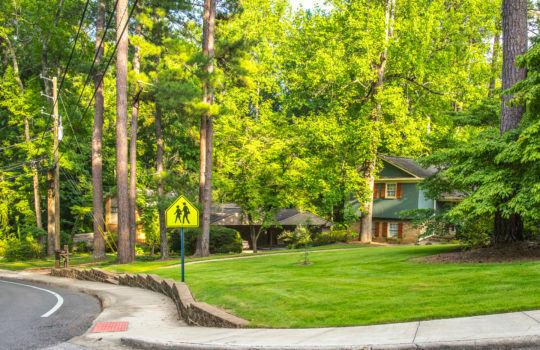 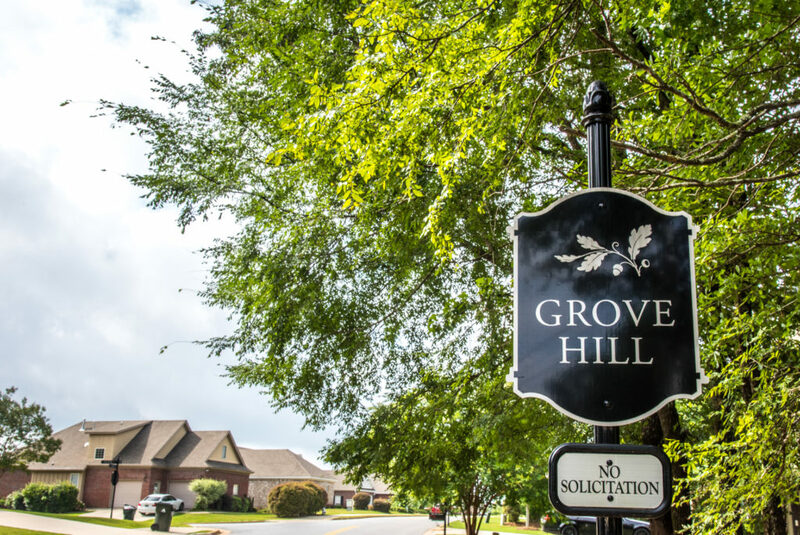 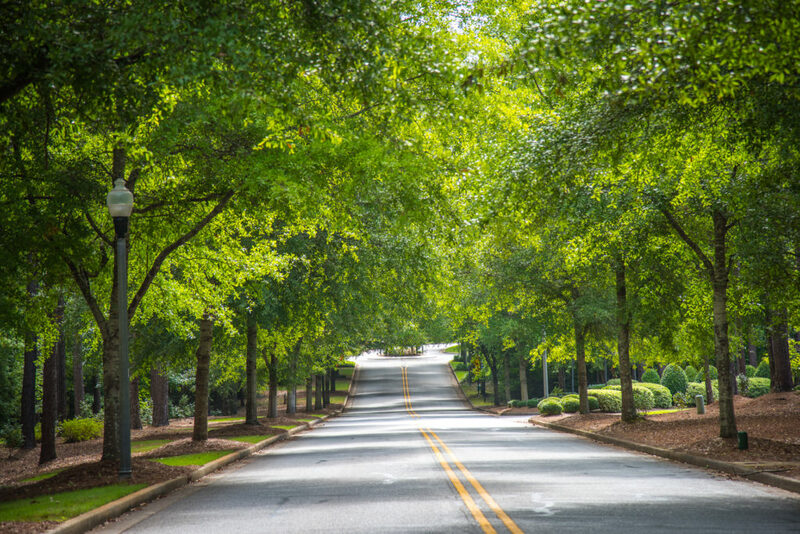 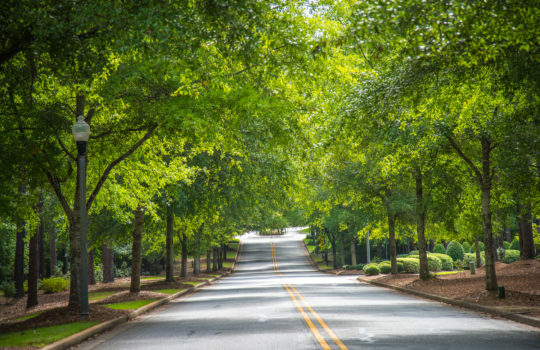 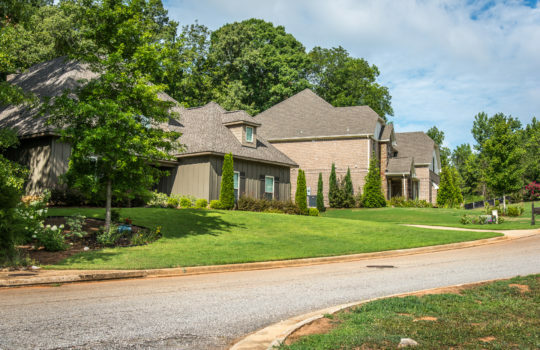 Decorated by streets lined with sidewalks and mature oak trees, Grove Hill has grown to be Auburn’s largest neighborhood since it was established in 1994. 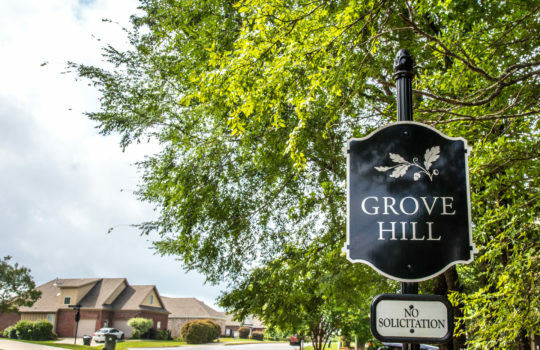 With home prices starting around $200,000, Grove Hill’s amenities stack up to create a cozy community that anyone would be thrilled to call home. Neighborhood amenities include green spaces, two swimming pools, a playground, a pond, a walking/bike trial and a clubhouse. Lundy Chase and Lundy West are made up of more than 200 residential lots located off of Richland Road. 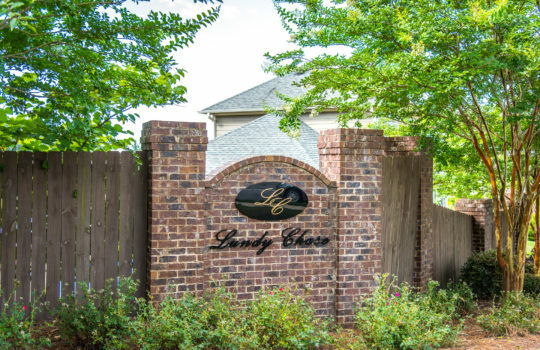 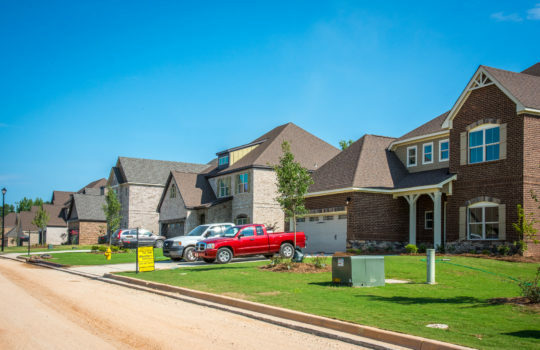 The first half of Lundy Chase was built in 2008, and home prices start around $170,000 with homes ranging from 1,200 to 2,000 square feet in the front and 2,400 to 3,000 square feet in phase two. Lundy West was developed later in 2010, and home prices start around $160,000 with home sizes ranging from 1,200 square feet to 2,000 square feet. 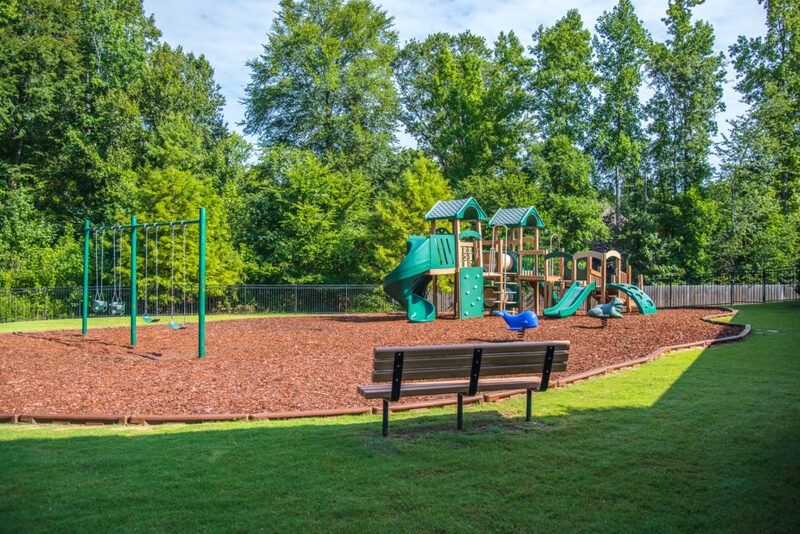 The two communities share a neighborhood pool and playground, creating a pleasant, safe, family-oriented environment. 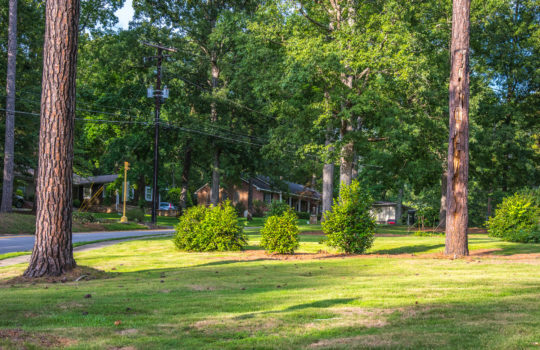 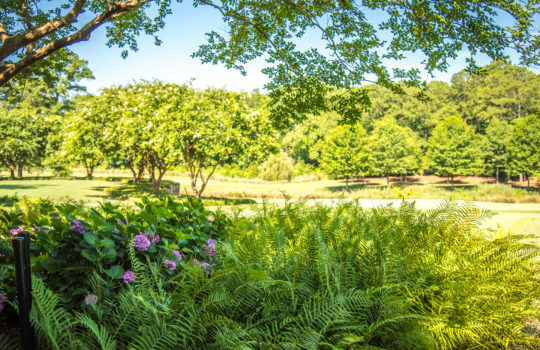 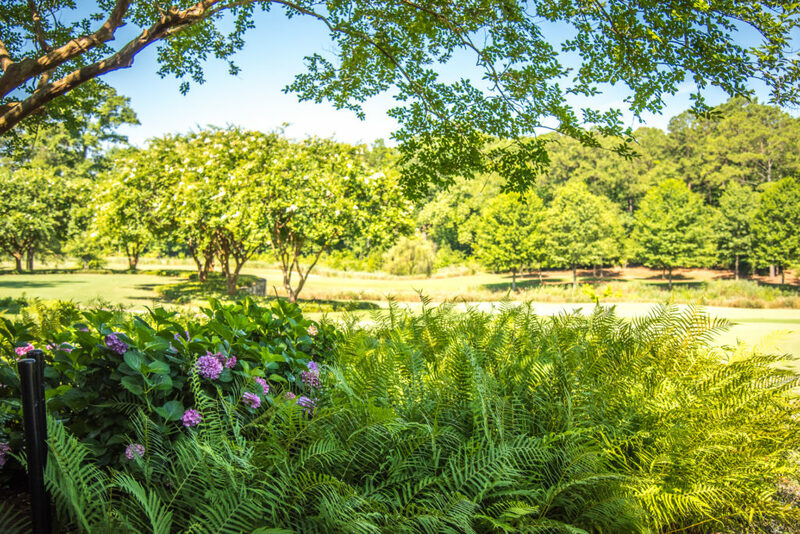 Located off South College Street, Mimm’s Trail is minutes from Chewacla State Park and adjacent to Ward Bike Trail, Fountainview Mansion and Auburn Links Golf Course—right off of Interstate 85. 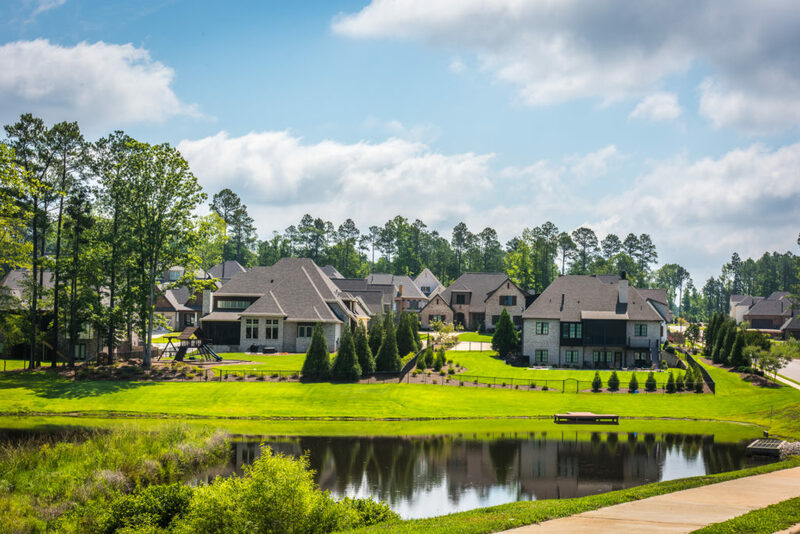 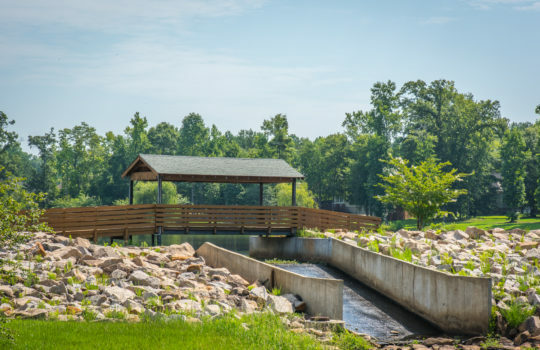 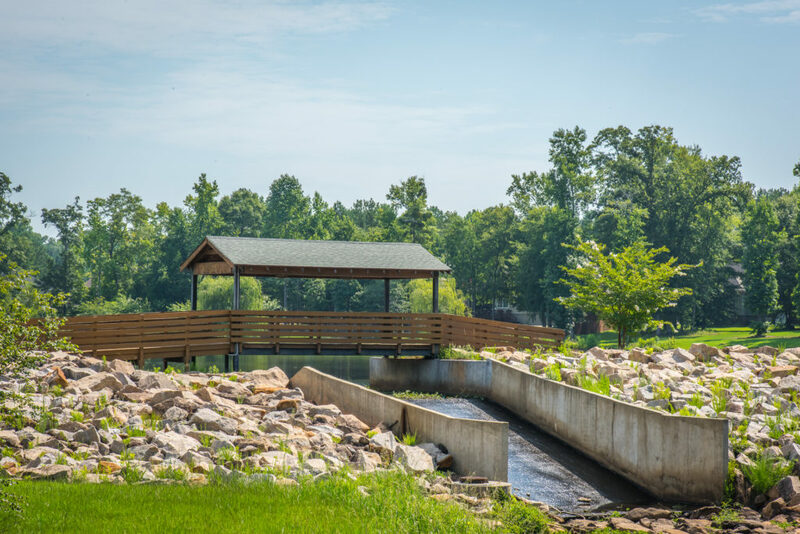 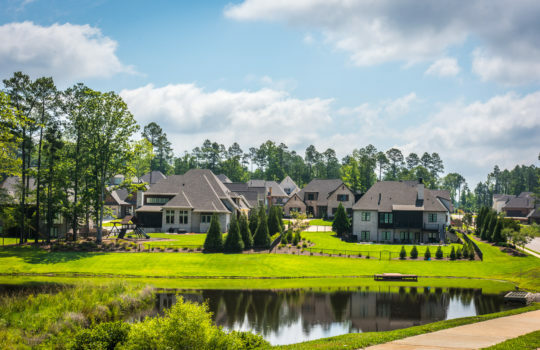 As one of Auburn’s fastest-growing communities, Mimm’s Trail’s newest addition, The Waters at Mimm’s Trail, features a lake with walking trails, cobblestone entrance, sidewalks, lamp posts, views and green space. 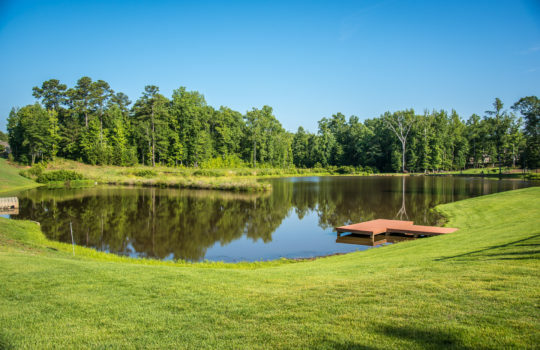 A pool, community garden, stocked lake and putting green are all planned amenities. Prices in Mimm’s Trail start around $260,000. Indulge in a lavish lifestyle in the peaceful Moore’s Mill community. 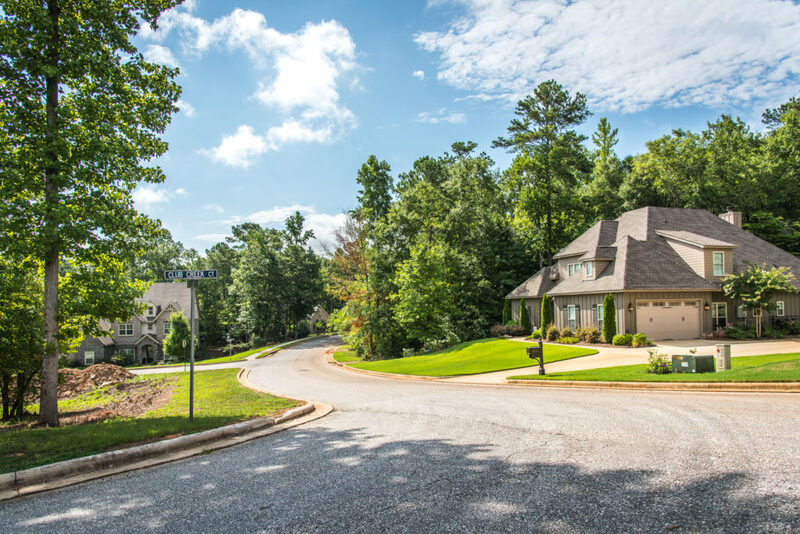 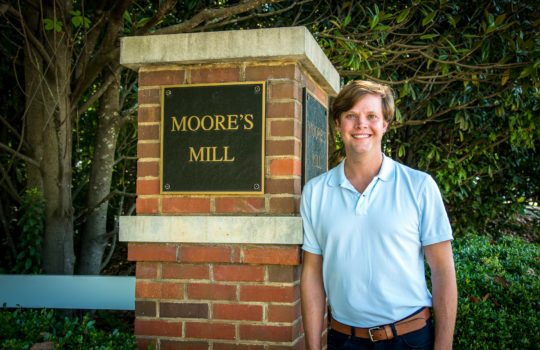 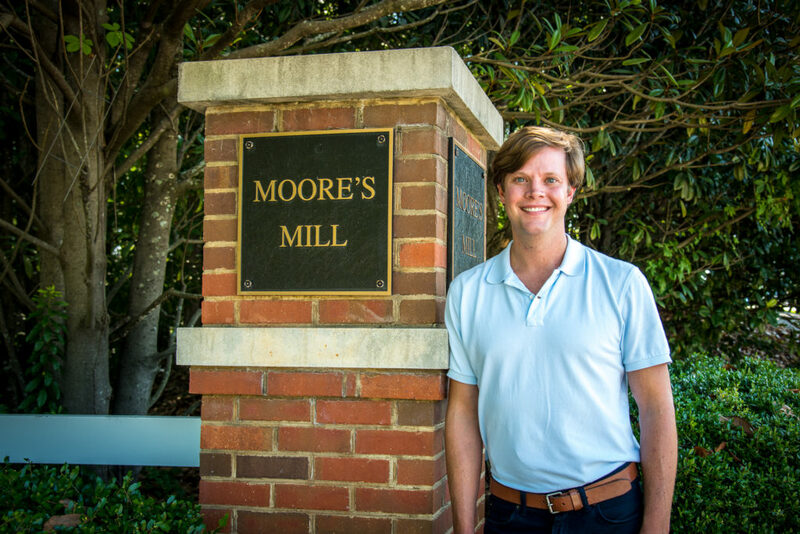 Established in 1992, homes in the Moore’s Mill neighborhood start around $200,000 and border Moore’s Mill Creek the Moore’s Mill golf course on the north side. 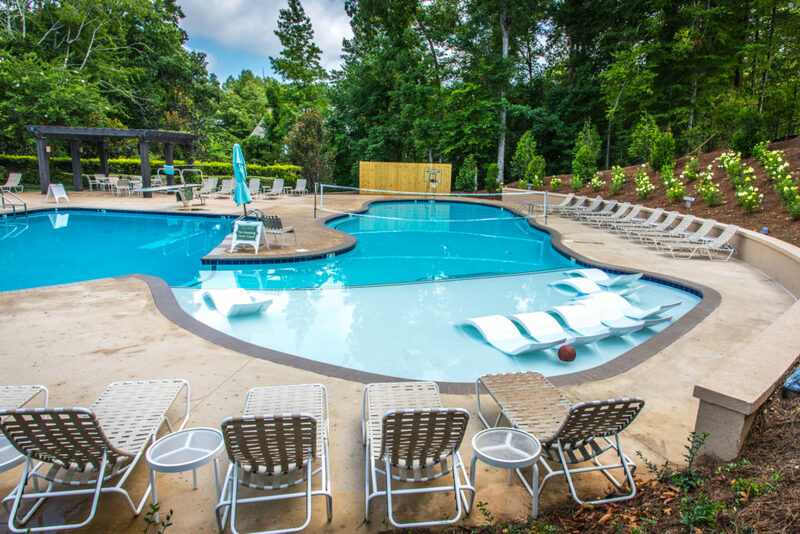 Amenities include a private pool with open-air cabana as well as a green space for outdoor activities. 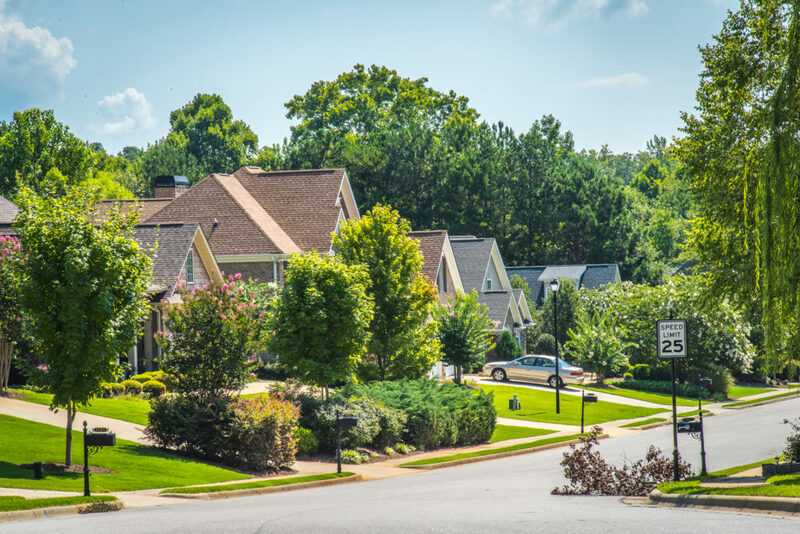 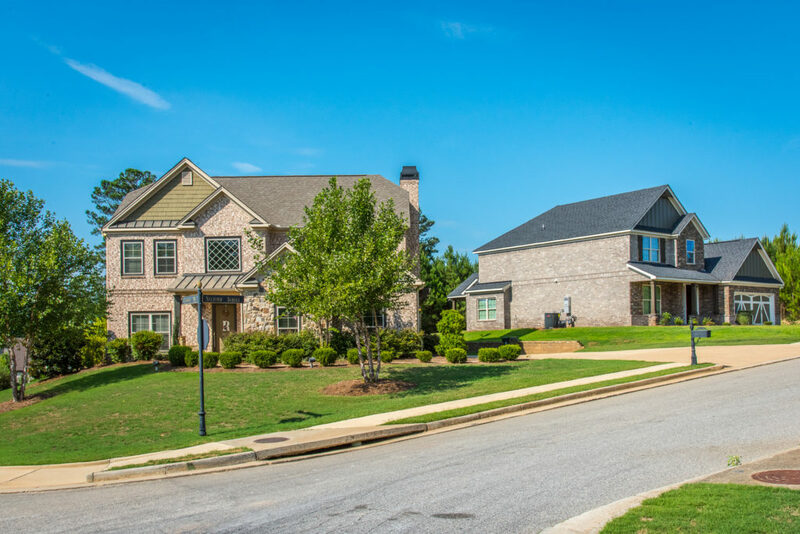 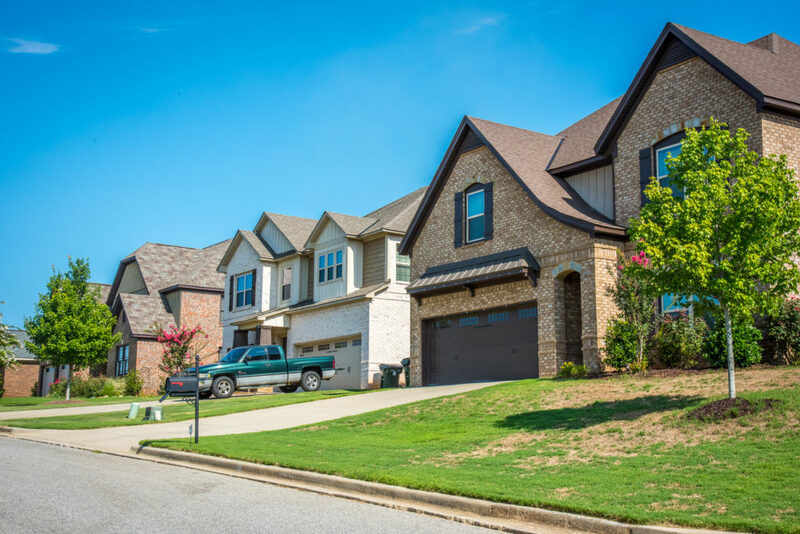 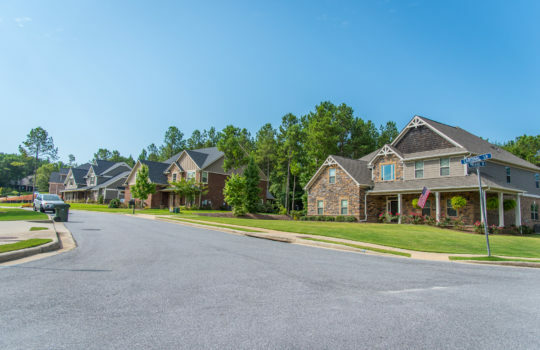 The neighborhoods is convenient to Interstate 85, downtown Auburn and Tiger Town and is serviced by Dean Road and Wrights Mill Road elementary schools. 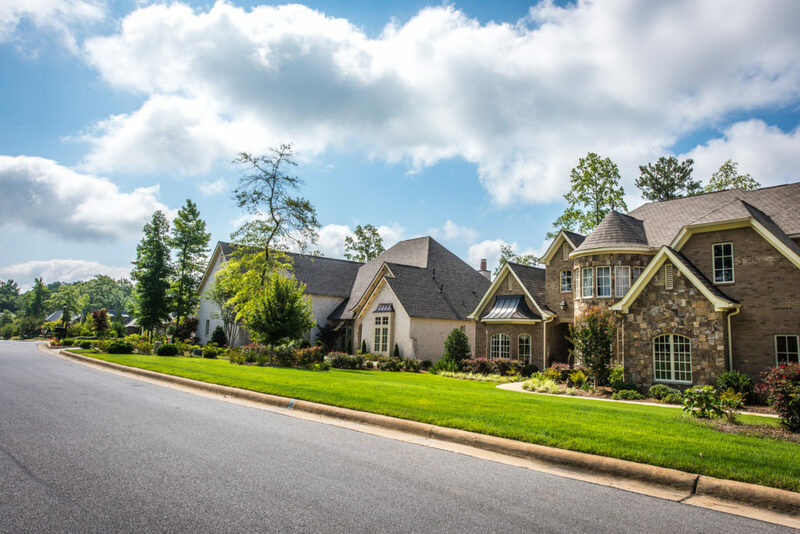 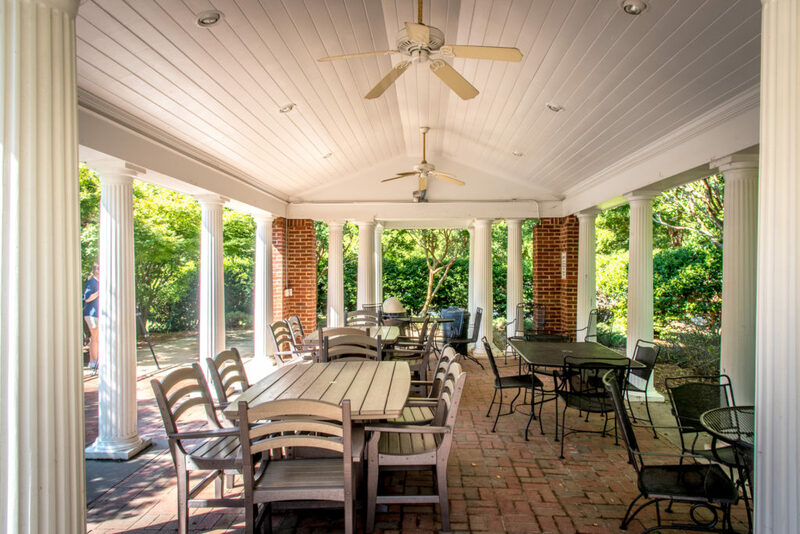 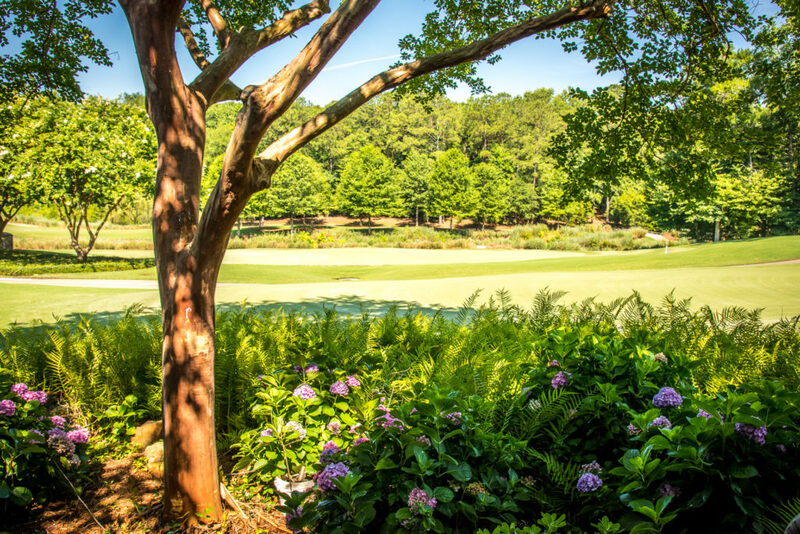 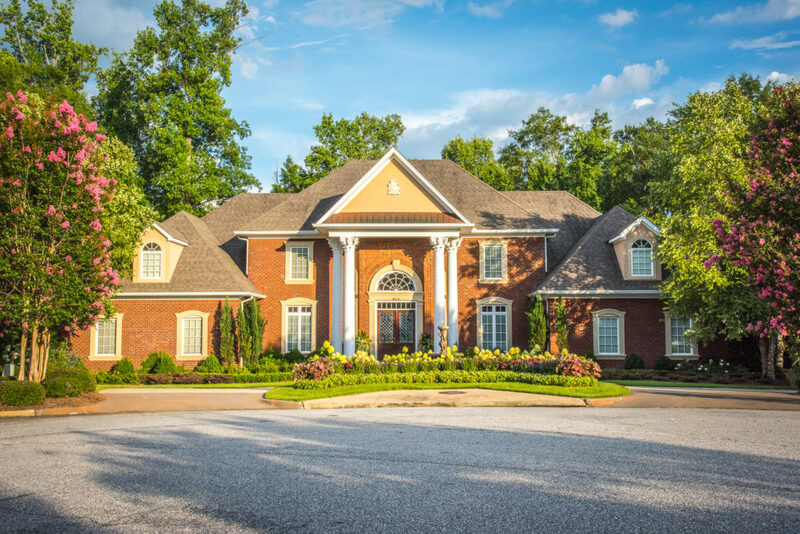 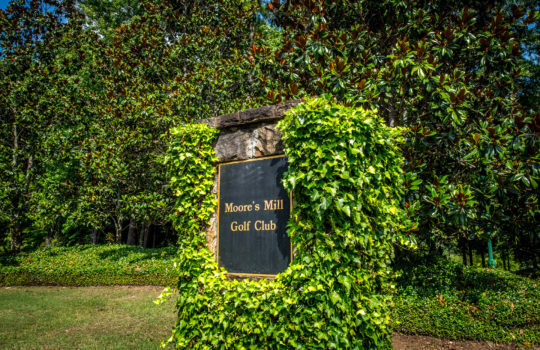 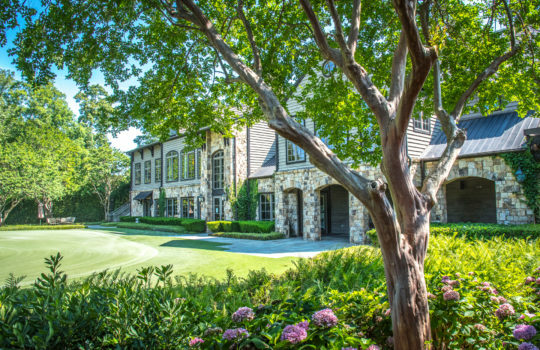 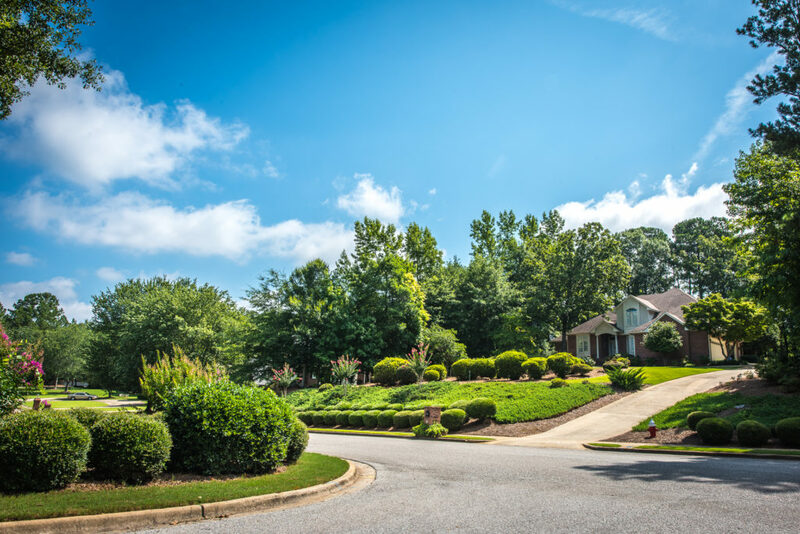 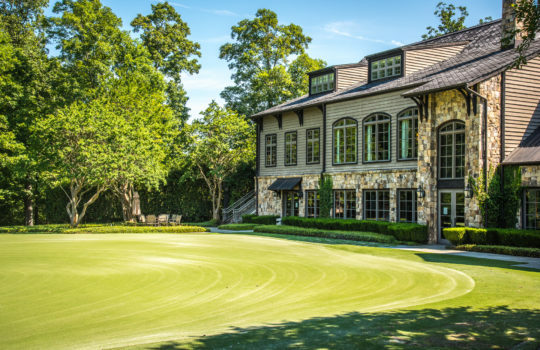 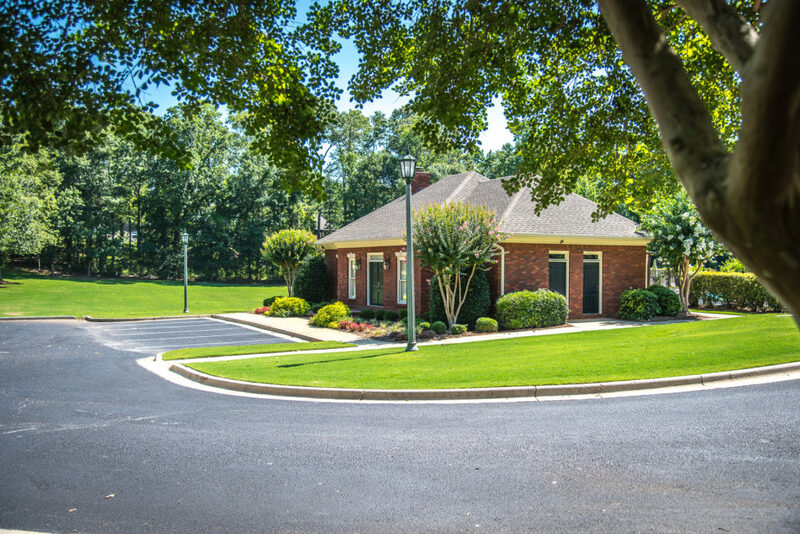 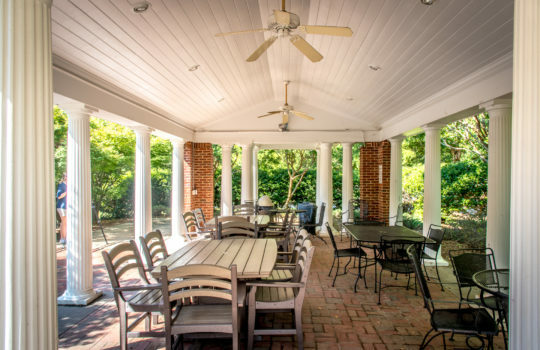 Moore’s Mill Golf Club, located on the south side of Auburn across Interstate 85, allows for golf course and country club living close to a host of amenities to cultivate a fine residential atmosphere. 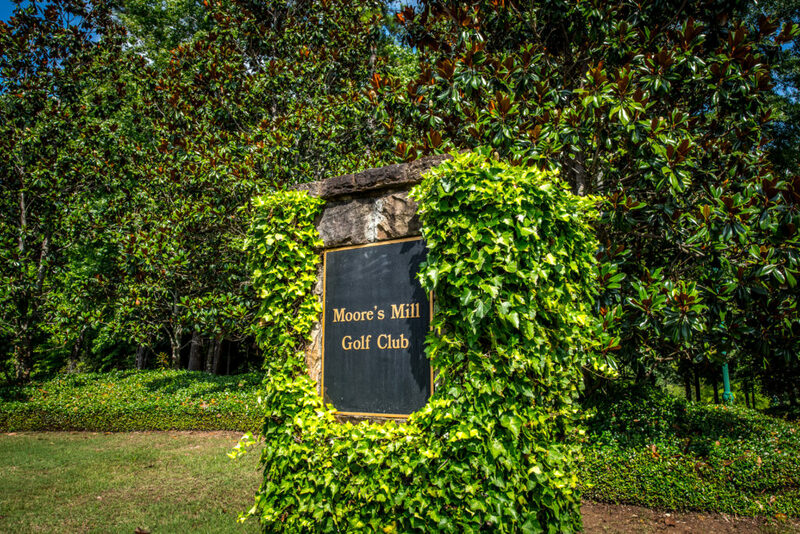 Moore’s Mill Golf Club was built in 2005, and homes in the neighborhood start around $400,000. 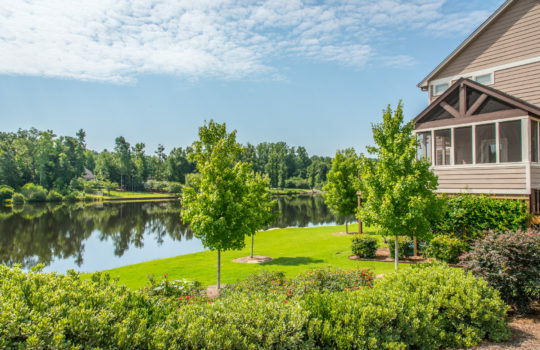 Many homes boast views of Moores Mill Creek and golf course. 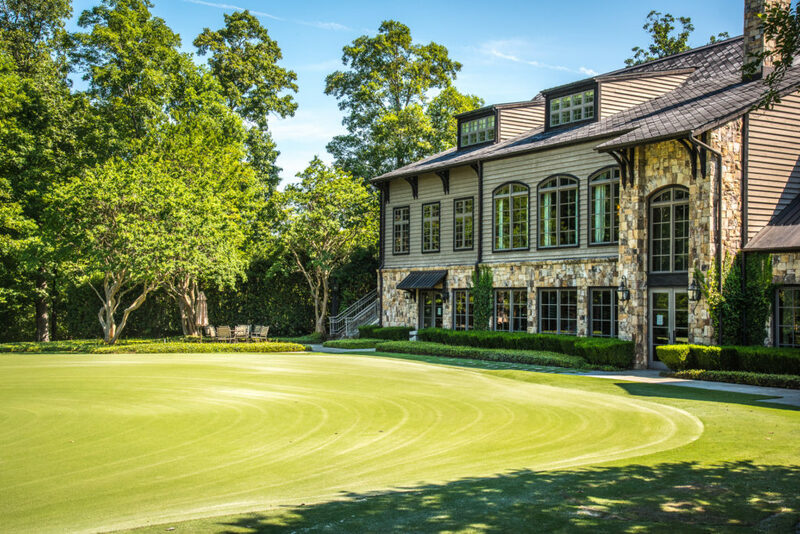 The golf course features a clubhouse with clay tennis courts, a fitness center, two pools, elite dining and an outdoor entertaining space. 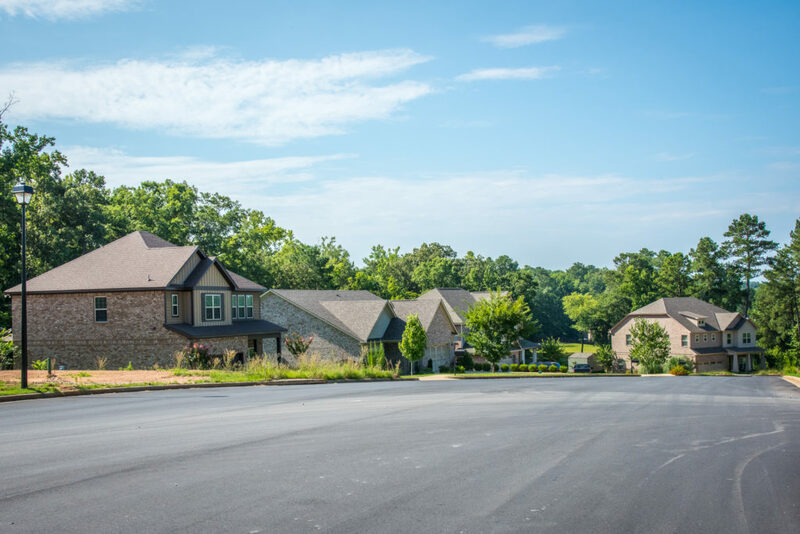 Situated in the desirable Moore’s Mill area in south Auburn, Ogletree Village offers affordable homes starting at $140,000. 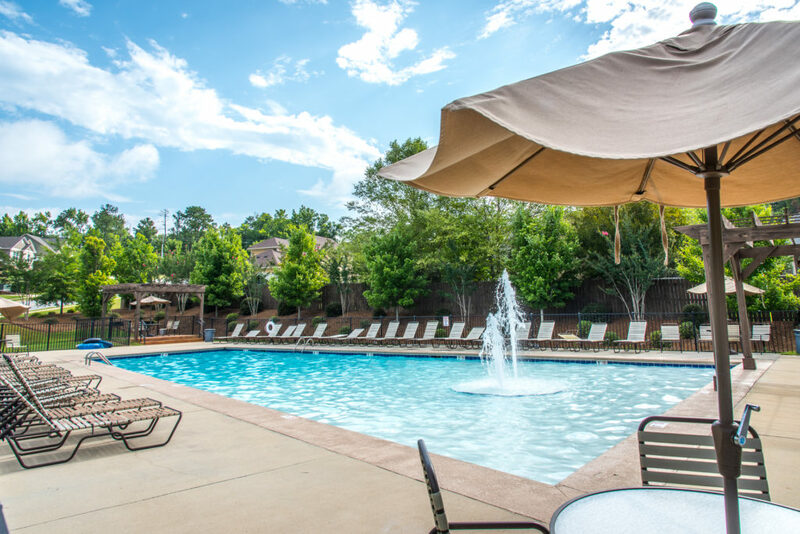 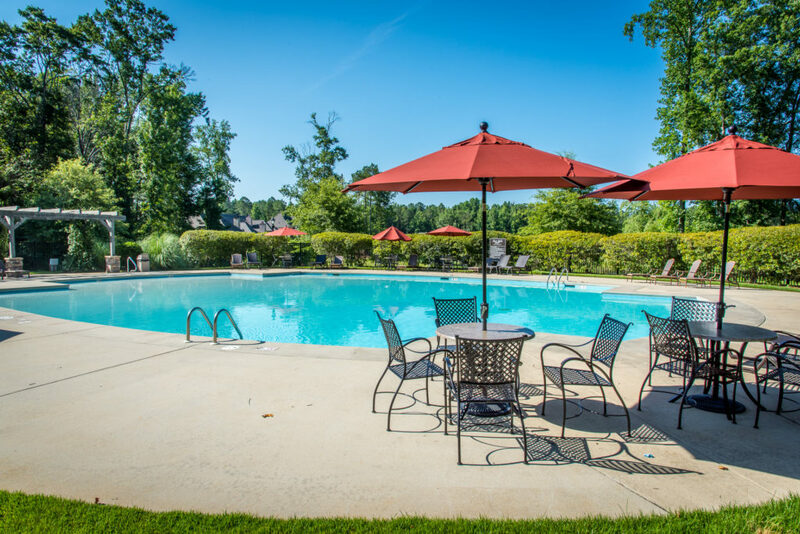 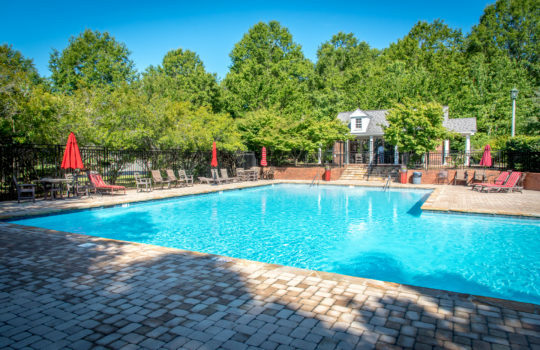 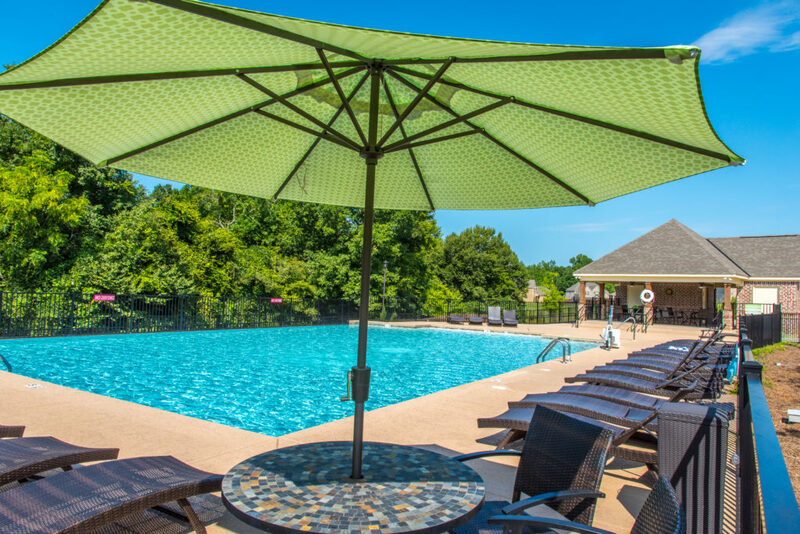 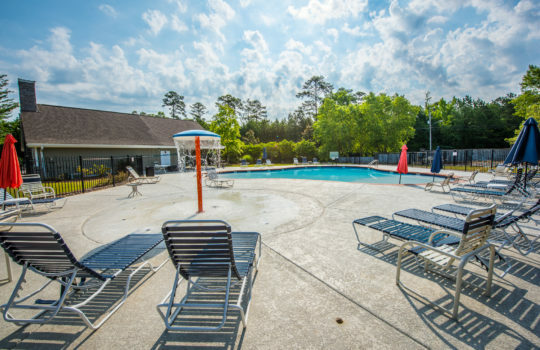 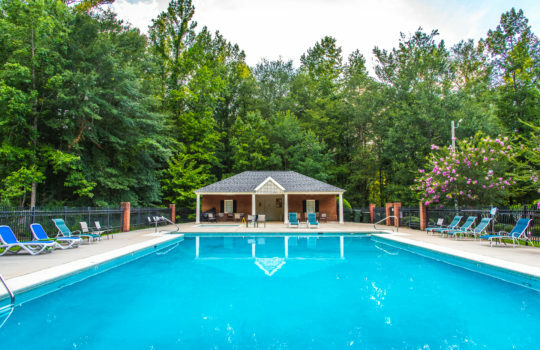 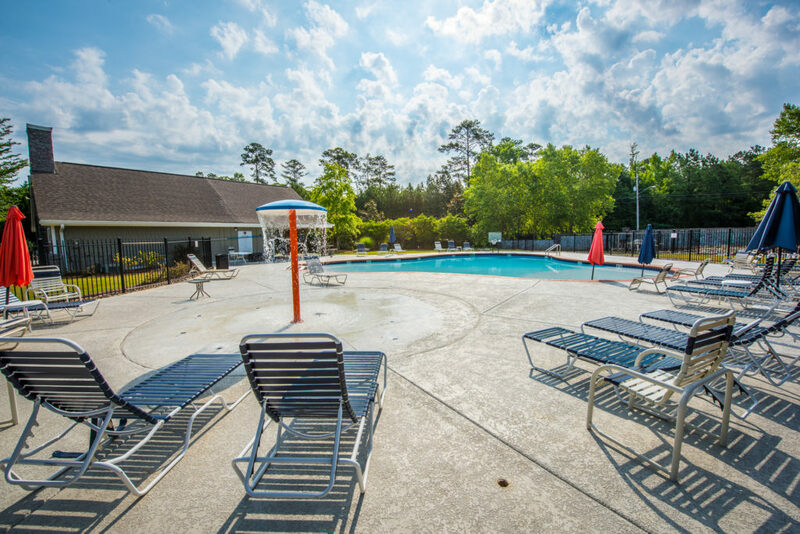 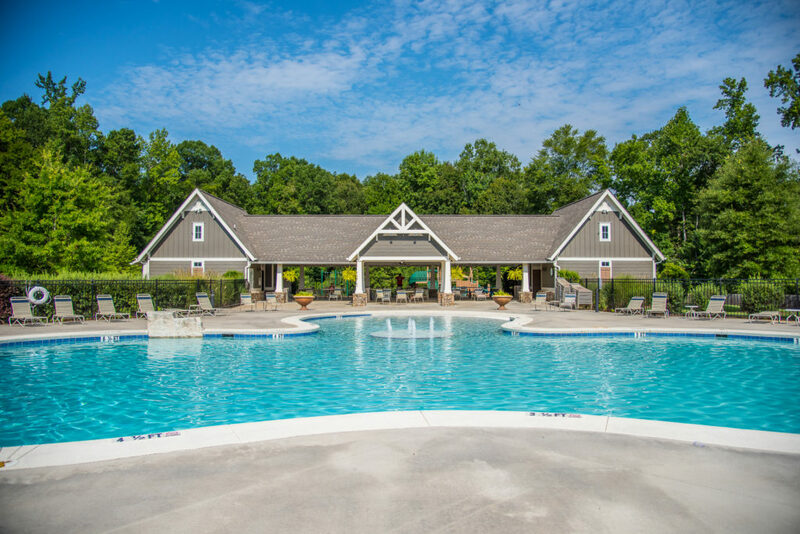 With houses built from 2000 to 2003, Ogletree Village boasts a relaxing neighborhood pool for its residents. 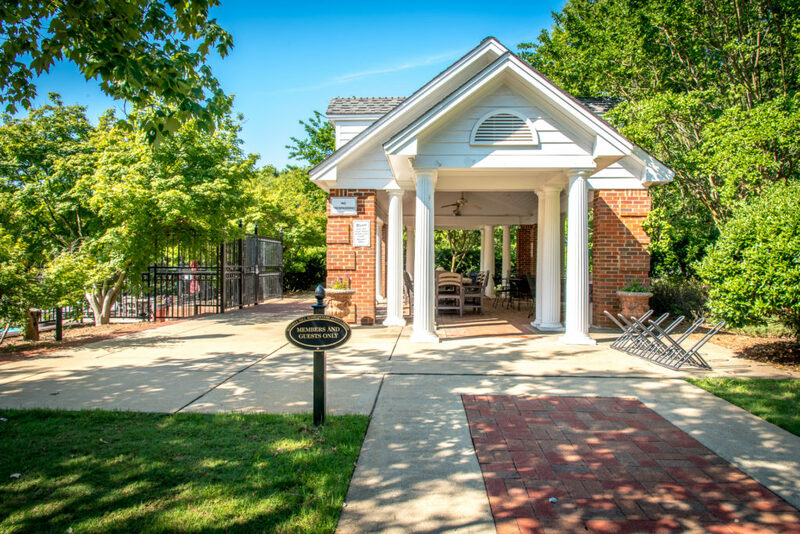 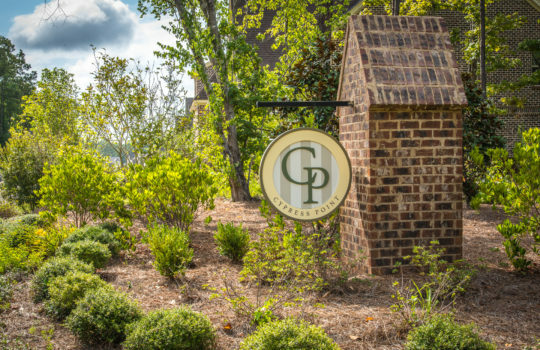 Conveniently located, Ogletree Village is blocks from the Moore’s Mill Golf Course and Country Club and is near downtown Auburn, Auburn University, Tiger Town and more. 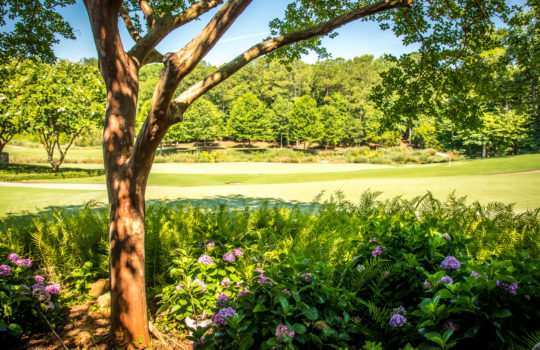 Nestled in between the fourth, fifth and sixth holes of the Auburn University Club Golf Course, PARC at Auburn University Club was established in 2014 and features homes starting at $300,000. 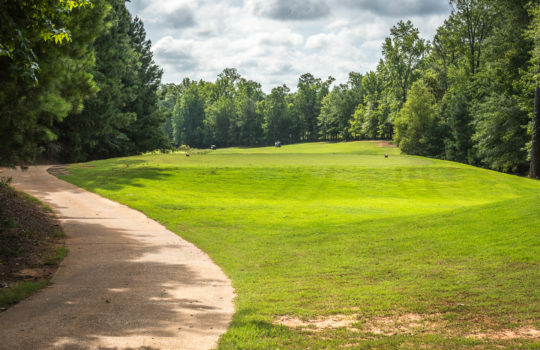 Its name based on outdoor recreational areas within the community, PARC homes offer serene views of the golf course and its centrally-located green spaces. 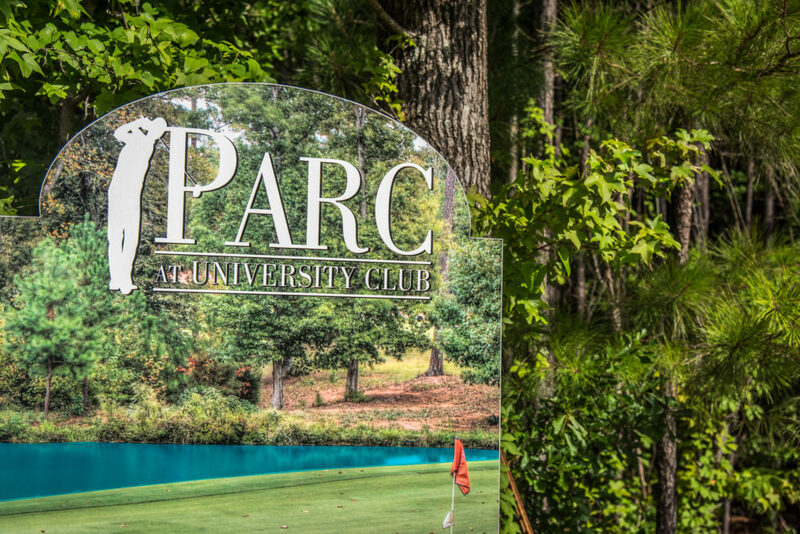 Located across the street from Auburn’s Richland Elementary and Yarbrough Tennis Center, PARC is only minutes away from downtown Auburn and Auburn University. 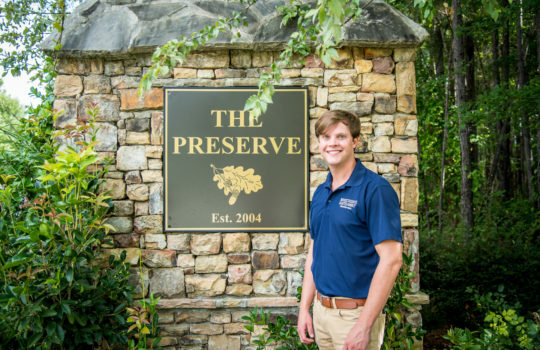 The Preserve offers the best of both worlds combining secluded, natural beauty with city conveniences. 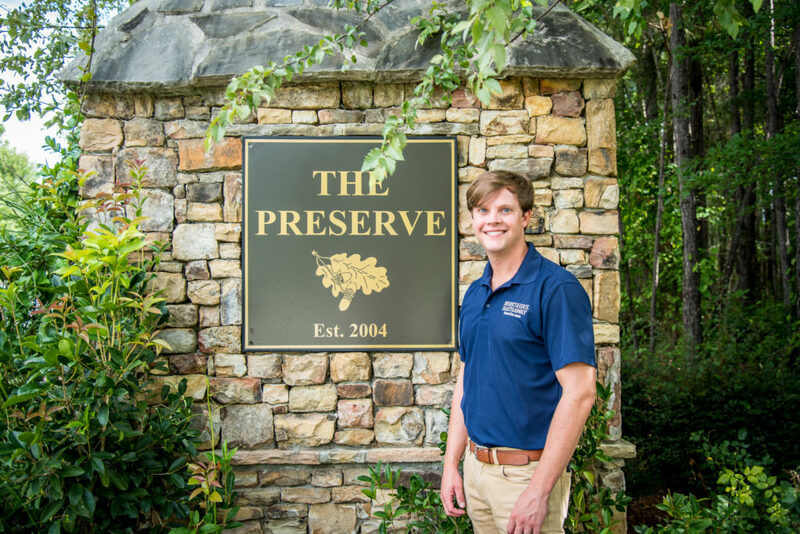 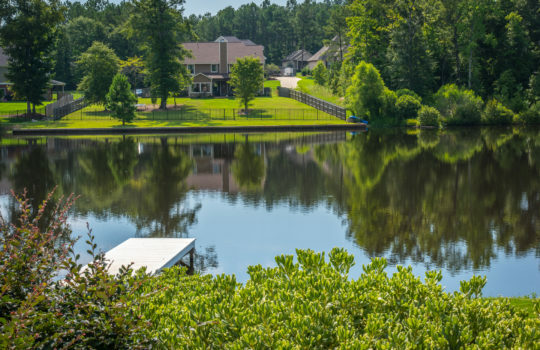 Situated on 667 wooded acres between Auburn and Lake Martin, the Preserve is located in north Auburn off Farmville Road but is just minutes from downtown Auburn and Auburn University. 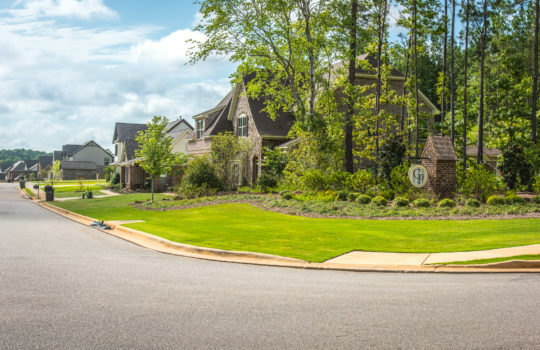 The Preserve was established in 2006, and home prices start at $180,000. 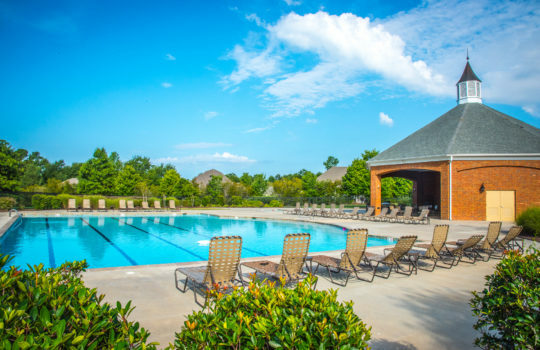 Residents enjoy a large clubhouse and pool, covered bridge, walking trails and lakes. 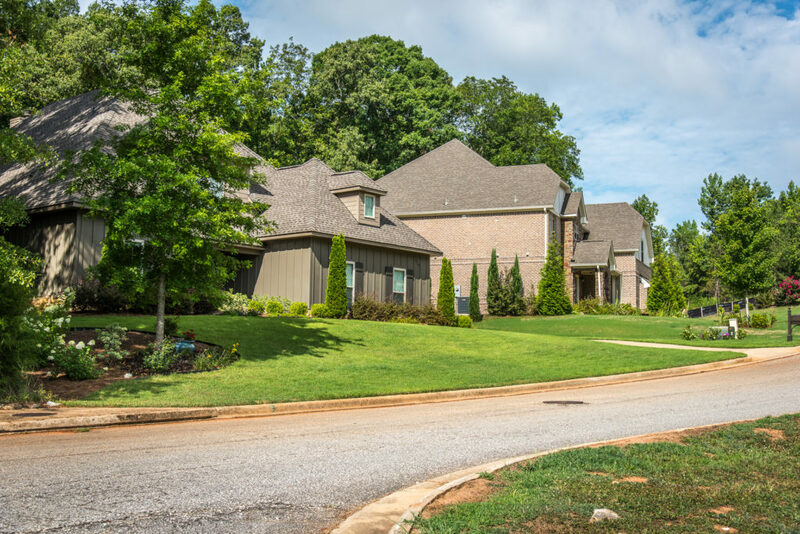 Escape traffic congestion while still being minutes from everywhere you need to be at Solamere off of Highway 14 West in Auburn. 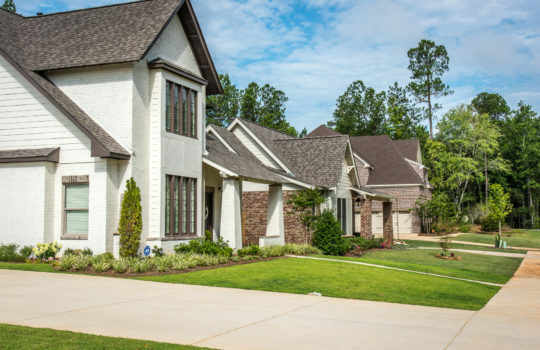 Featuring craftsman-style homes, Solamere includes a beach-entry pool with fountains and cabanas, a community playground, sidewalks and green spaces. Homes range in age from 1989 to 1994, and prices start in the mid $200,000s. 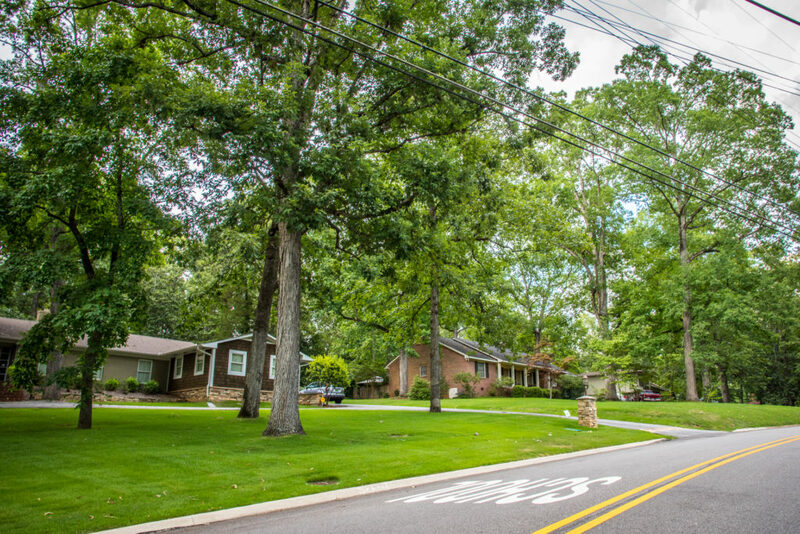 Adore the attraction of a charming Italian village on the outskirts of Auburn in Tivoli. 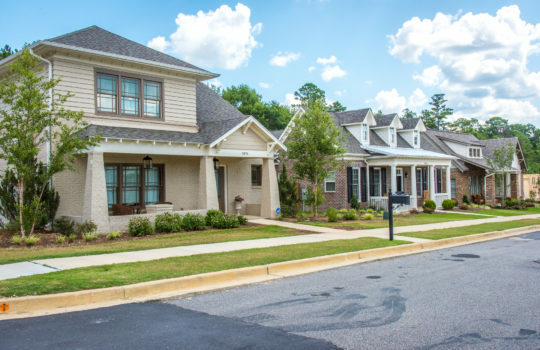 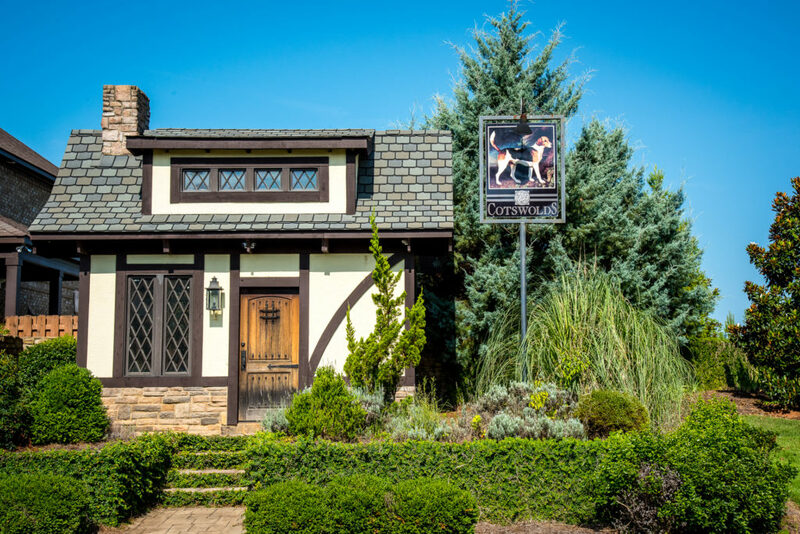 Located off North College Street across from the Auburn University Fisheries, Tivoli’s “old world” style brings character to its craftsman-built homes. Named for a city in central Italy that was once a summer retreat for Romans, Tivoli was established starting in 2008, and home prices start in the $200,000s. 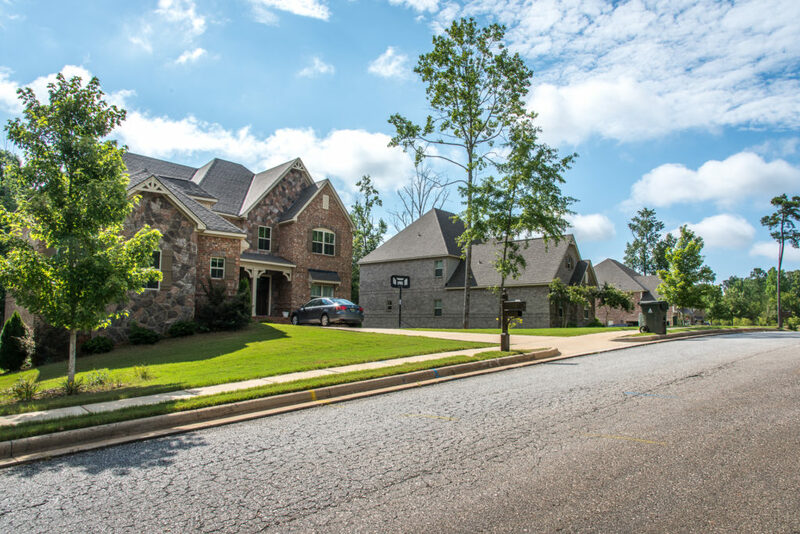 Tutton Hill is not your average southern subdivision, blending old world craftsmanship and European-inspired architecture to create an appealing juxtaposition of traditional and modern. 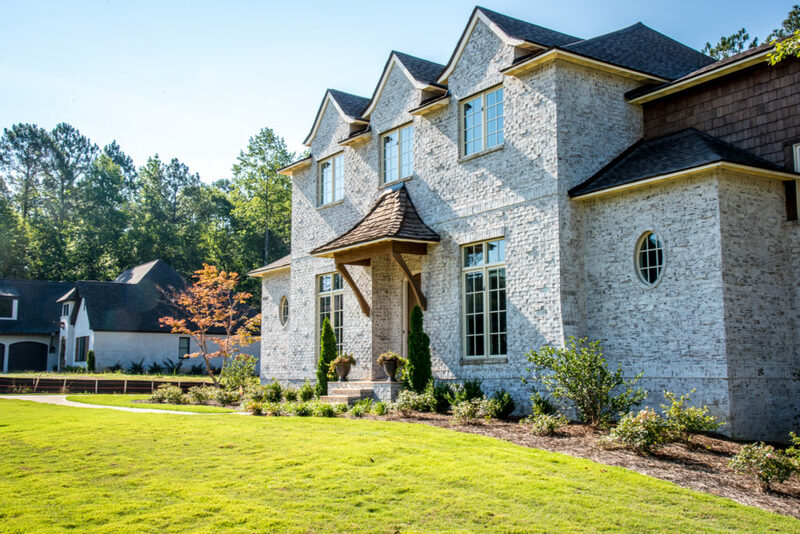 Upscale interior selection and custom-designed exterior features make Tutton Hill’s homes stand out among the rest. Established in 2008, homes start in the mid $300,000s. 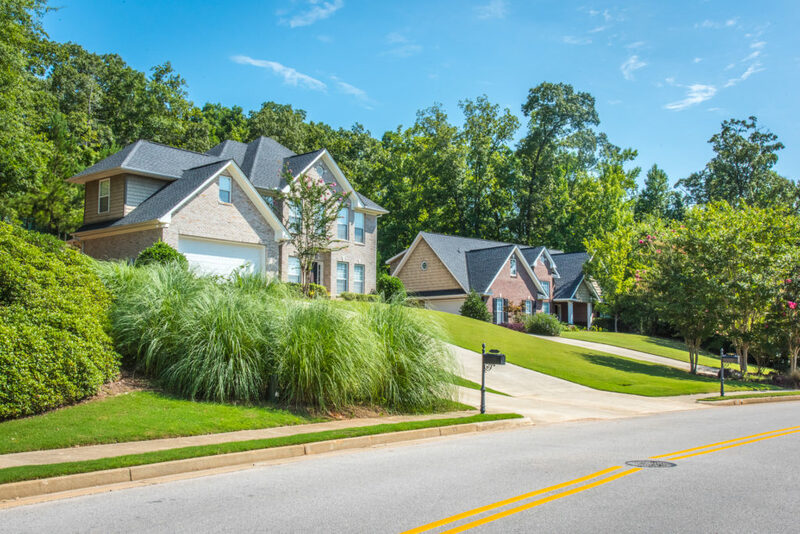 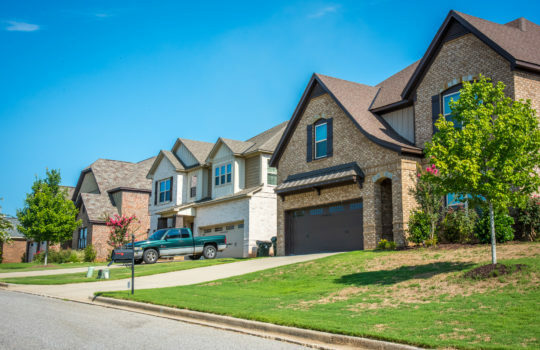 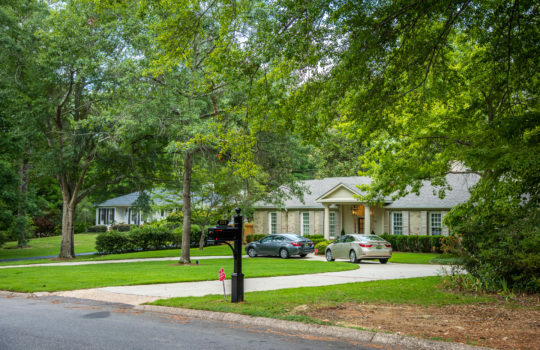 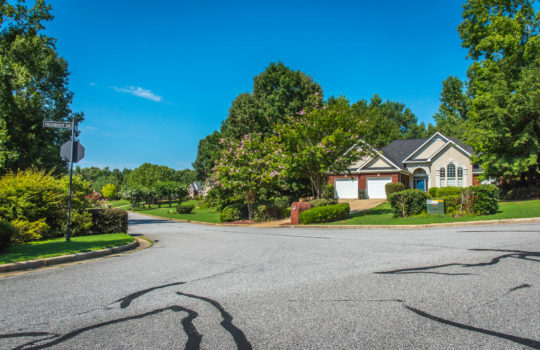 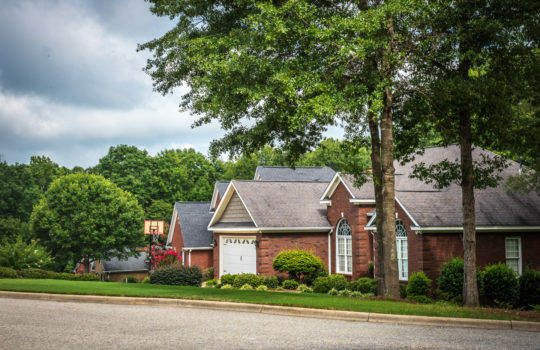 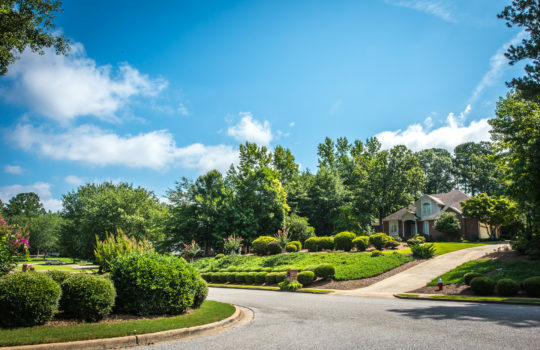 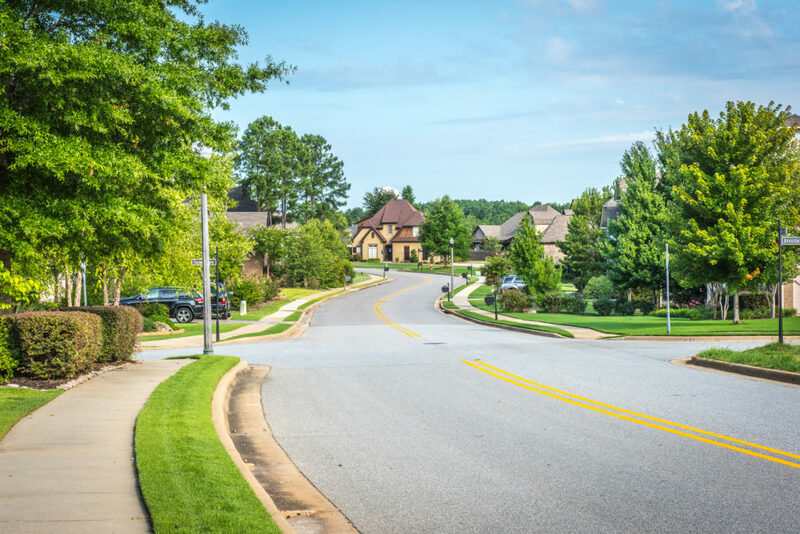 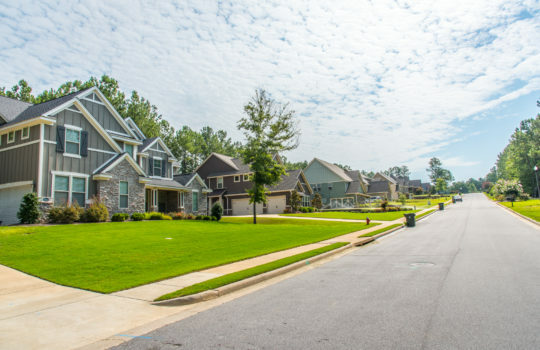 The neighborhood is located off of Hamilton Road close to Moore’s Mill Golf Club and Country Club, Saugahatchee Country Club and Tiger Town shopping center. 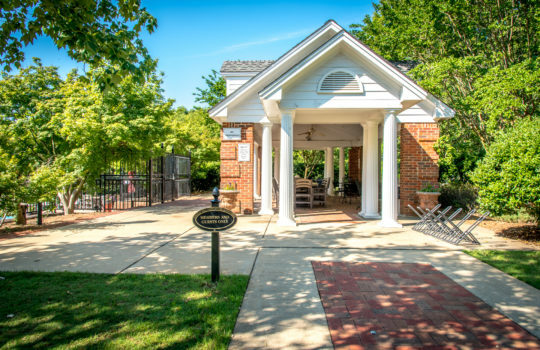 Experience the finer things in life at White Oaks. 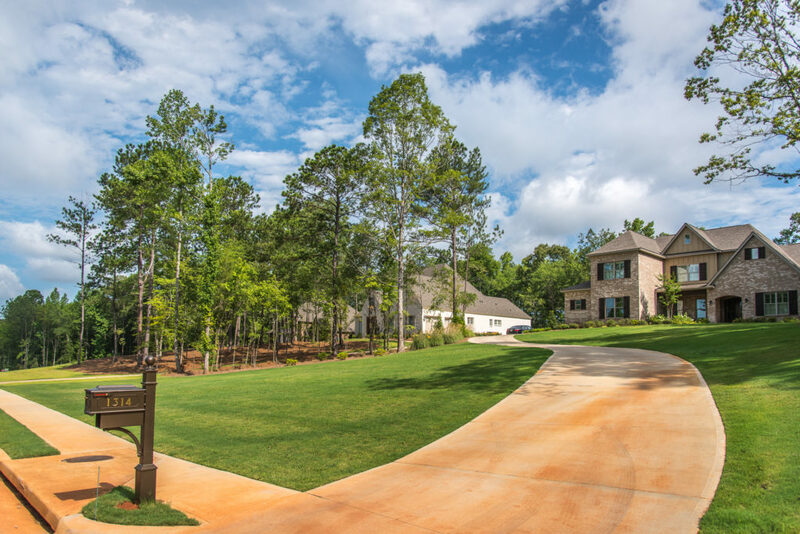 This distinctive community built starting in 2007 is made up of single-family executive estates and extravagant cottage homes. The neighborhood has been seamlessly integrated into the natural setting that surrounds it, with a lake and waterfall acting as ideal outdoor accents. 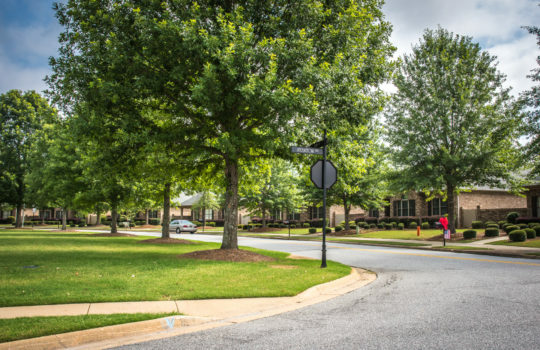 Located off Bent Creek Drive, White Oaks is around the corner from Saugahatchee Country Club and Interstate 85. Homes in White Oaks start in the upper $400,000s. 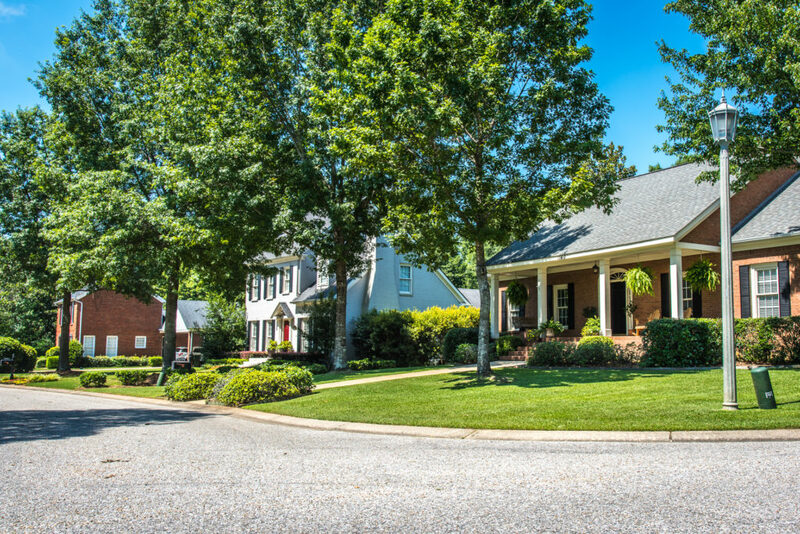 The Wrights Mill neighborhood off Wrights Mill Road showcases homes with character that span a century’s time, with houses built between the mid-1900s and the mid-2000s. 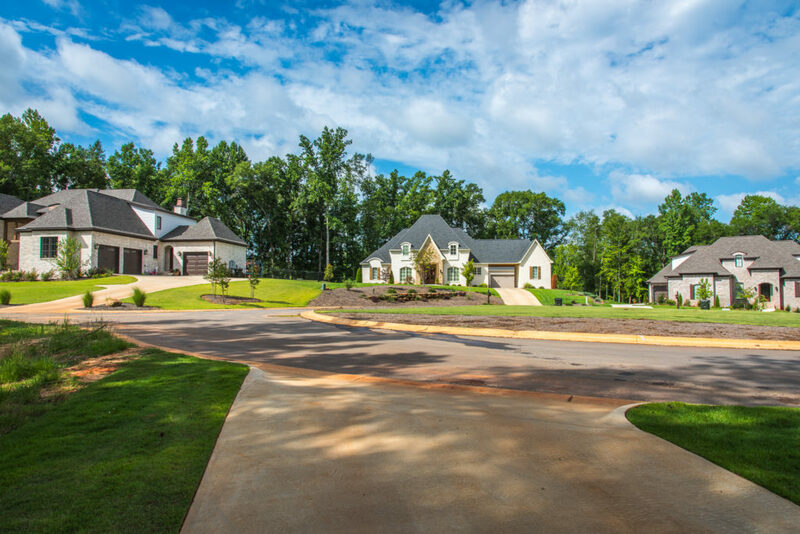 Mature foliage frames custom-built homes on large lots, and homes are priced starting at $200,000. 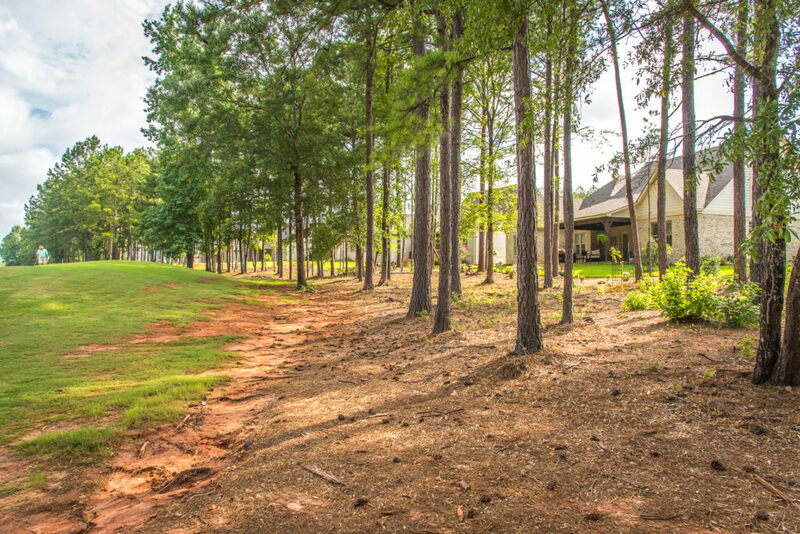 Wrights Mill is in walking distance of Chewacla State Park and is close to Auburn Links Golf Course, Interstate 85 and shopping and dining in both Auburn and Opelika.